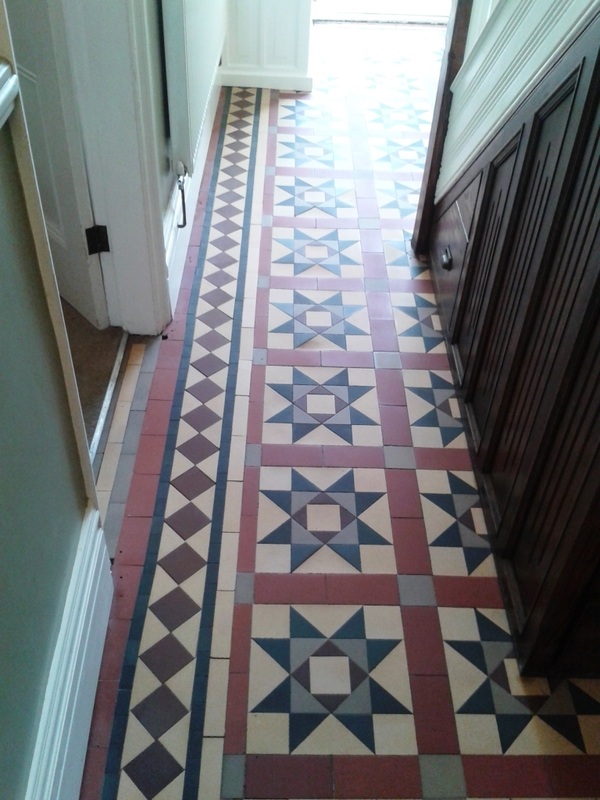 The owner of this pre 1900s period house in the town of Melksham contacted us to clean & seal their Victorian tiled hallway which had been laid in a geometric pattern and was the original floor from when the house was built. Given its age it was in excellent conditions and a real testament to Victorian engineering. 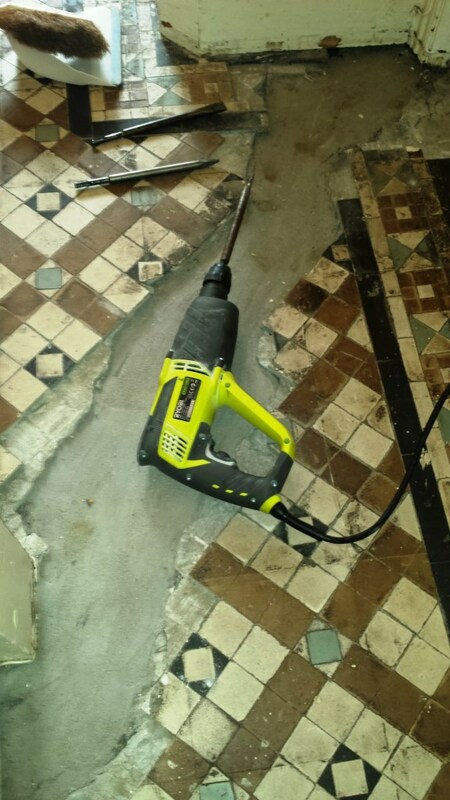 Firstly we mixed a strong solution of Tile Doctor Pro-Clean and Nano-Tech HBU remover; HBU stands for Heavy Build-Up and is a great product for getting deep stains out of tiled floors. The tiles were covered with the solution and left for twenty minutes so it could soak into the pores. We then attached a black pad to a rotary machine and scrubbed the area thoroughly. Any paint or adhesives was then removed using a scraper and once we were satisfied we then removed the slurry using a wet vacuum and rinsed several times with cold clean water and a deck brush to ensure we had removed all traces of cleaning product before sealing. Stubborn areas were re-treated and the process took most of the day so we then left the floor to dry overnight. Upon our return we tested the floor was dry with a damp meter, testing in a number of locations. The readings were fine so we proceeded to seal the floor using six coats of Tile Doctor Seal and Go which will protect the floor from further dirt build-up and staining, it also adds a nice subtle sheen to the tiles. All went well with no major problems and as you can see the tiles now look fantastic. 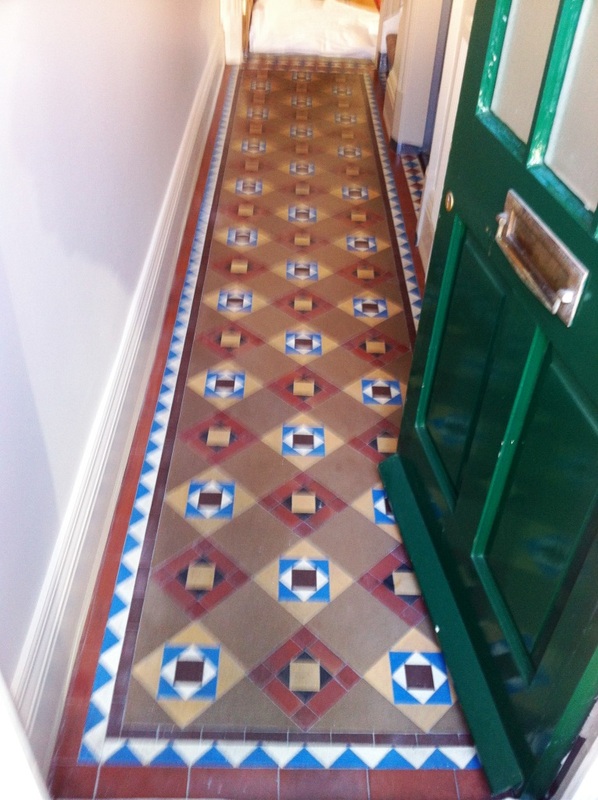 Details below of a customer in Telford who bought a house with a Victorian Tiled Hallway a couple of years prior and has been refurbishing it in sections. 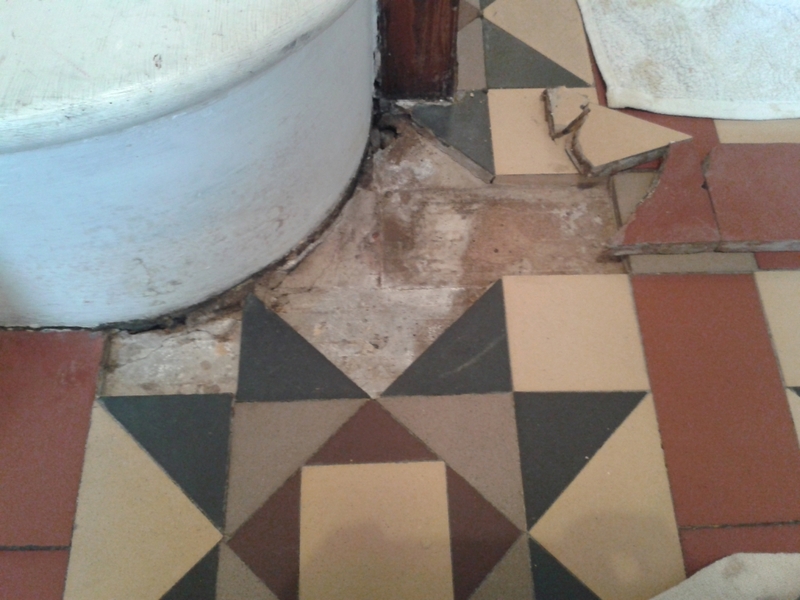 When I went there to do the quotation the floor I could see it was in a desperate state and in need of a deep clean and replacement of several broken and cracked tiles, there were several loose ones too. 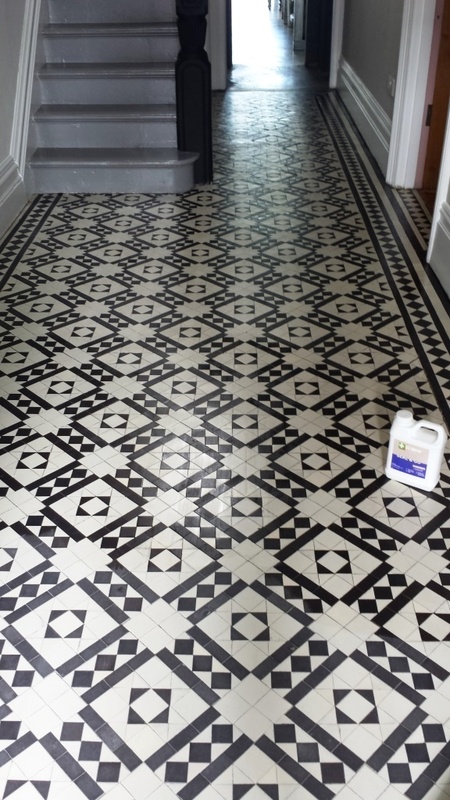 The floor was cleaned using a medium dilution of Tile Doctor Pro-Clean which was left to soak into the tiles for around 15 minutes before being worked into the tile and grout using a rotary machine fitted with a black scrubbing pad and a stiff grout brush. Pro-Clean is a strong alkaline cleaning product that is safe to use on Stone, Tile and Grout. The floor was given a thorough rinse with clean water and a wet vacuum was used to remove the water from the floor, stubborn areas were then spot cleaned using the same process and the floor was then left to dry off overnight. 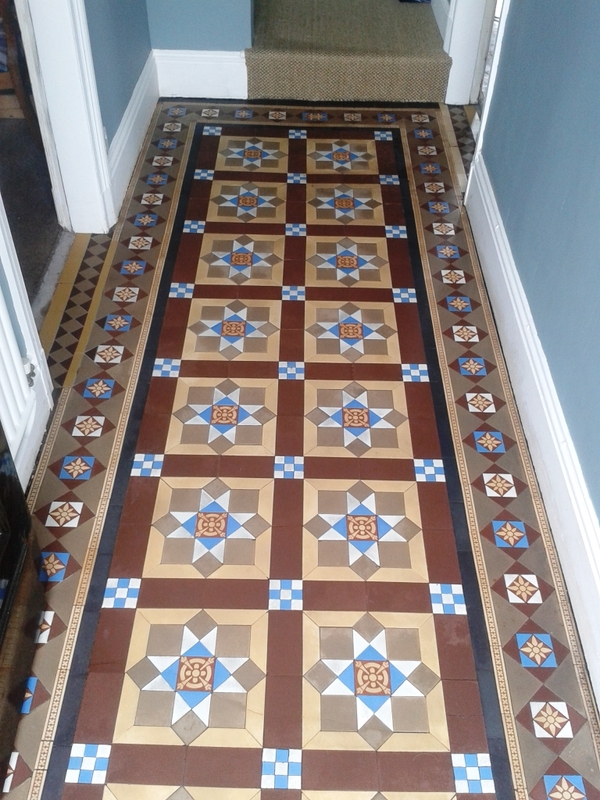 The next day I returned to do the repair work, originally there were seven tiles to replace, but I ended up replacing sixteen tiles and fixing twenty five, fortunately Victorian tiles are still popular and you can still source replacements. To ensure the repaired areas had sufficient tile for the adhesive and grout to set I left the floor for four days before returning to apply a sealer checking the moisture level first to ensure it was dry enough to take the sealer. 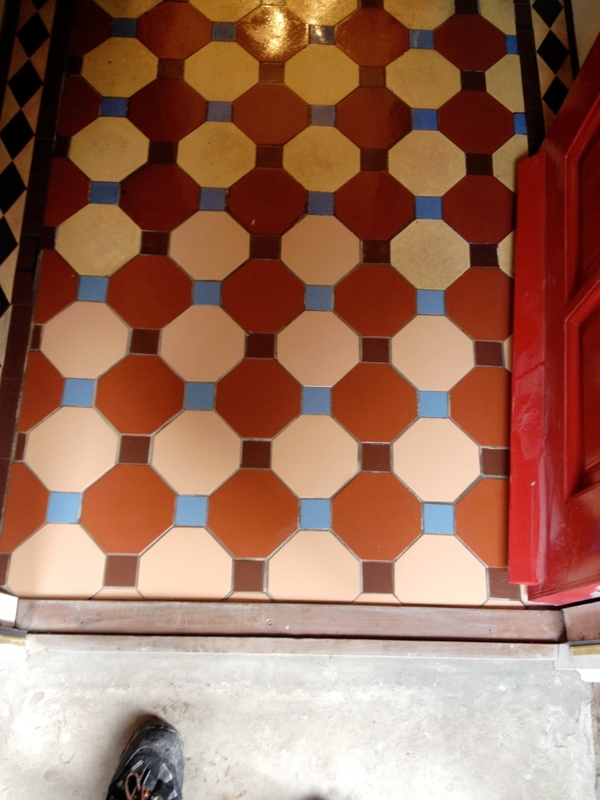 To seal the tiles which will help protect them from staining I applied five coats of Tile Doctor Seal and Go which works really well on Victorian tiles and adds a nice subtle shine to the floor also being water based you don’t get that smell that a solvent based sealer has. 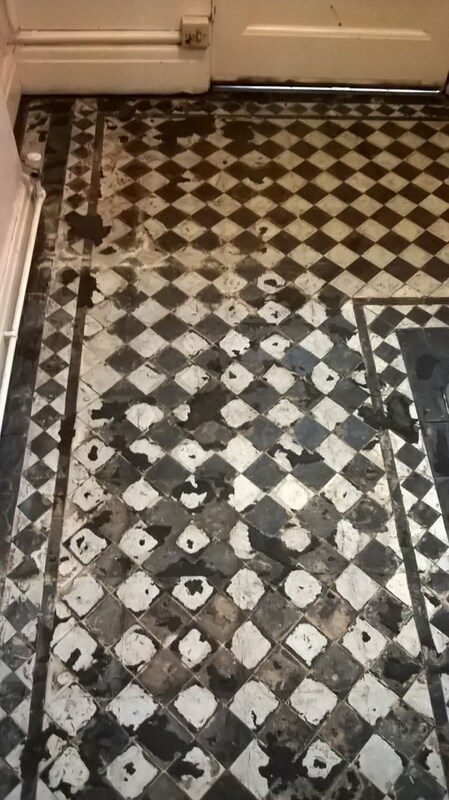 This original Victorian Geometric tiled floor was recently uncovered in the hallway of a house in Mapperley near Nottingham. 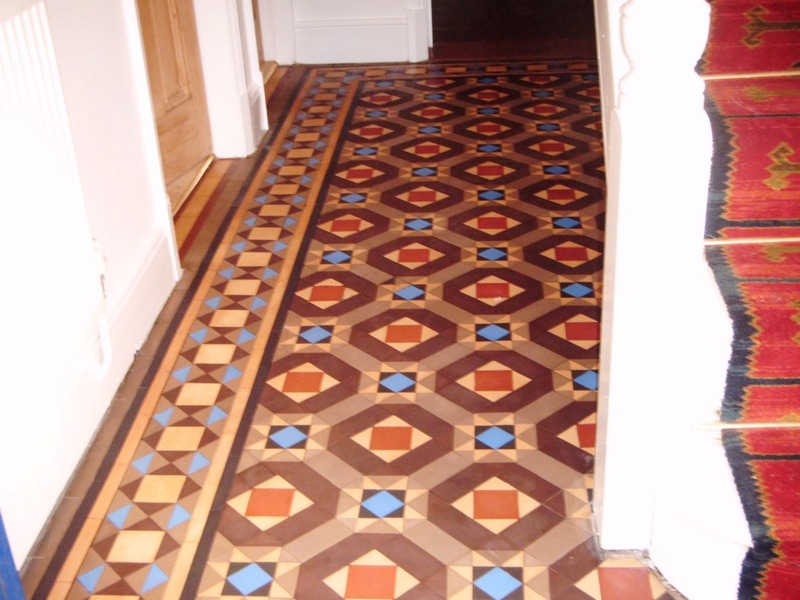 These beautiful old floors built by Victorian Craftsmen are often neglected and sometimes hidden by other floor coverings. 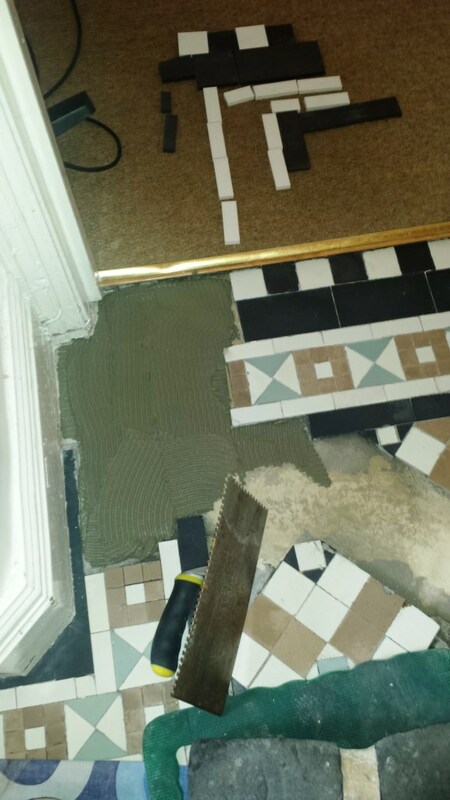 In this case we had to remove carpet, carpet grippers and underlay which had been stuck down and often we find vinyl tiles glued to the tile surface etc. 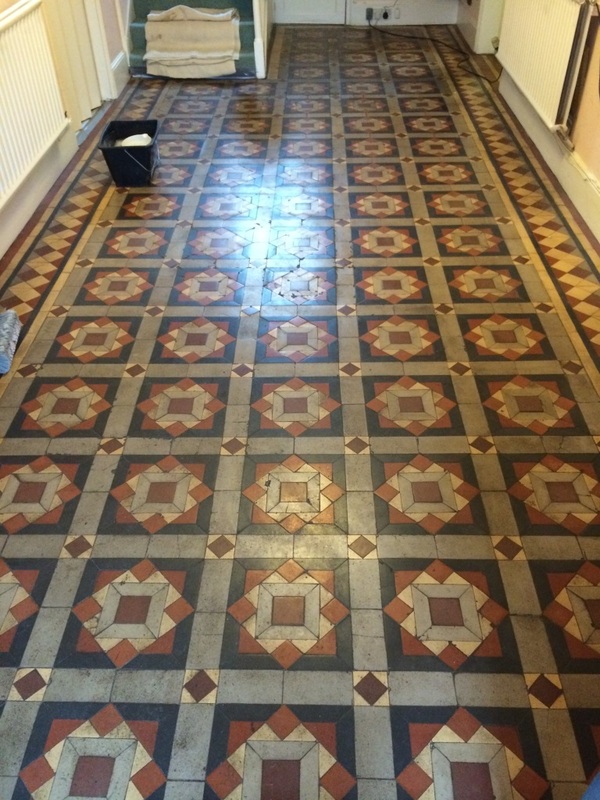 This takes its toll on the floor causing it to lose its vitality however help is at and in the form of the specialist Tile Doctor Restorative Cleaning and Sealing Treatment. The first job was to protect the adjacent carpets and wood flooring, before starting the cleaning process. Then I applied a strong solution of Tile Doctor Pro-Clean which is a heavy duty cleaning solution mixed with Remove and Go which is a coating remover. 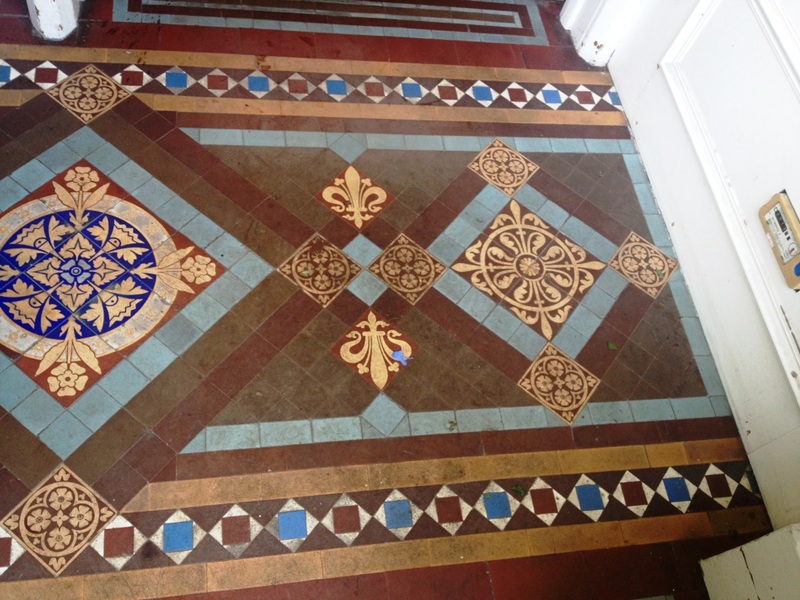 This helps to remove old and worn coatings along, with the many years of soiling which was hiding the vibrant colours of the Victorian tiles beneath. This unique cleaning solution along with a combination of dwell time and mechanical agitation breaks down the many years of contamination on the tiles. During this stage of the cleaning process, we also sometimes have to remove paint and adhesive residues. 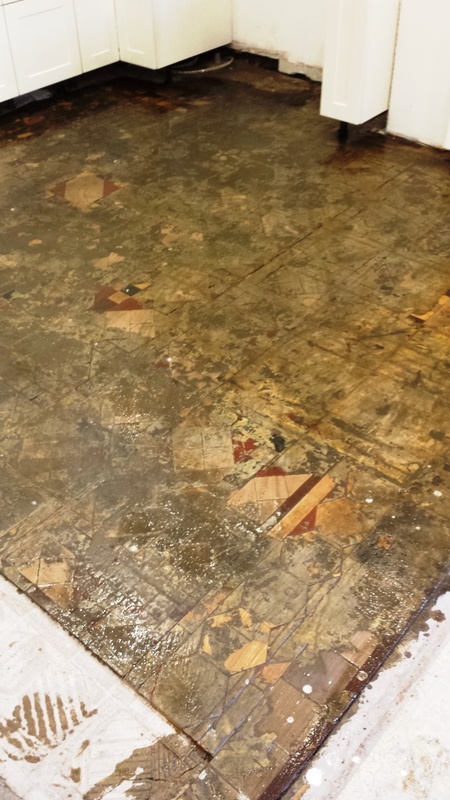 The cleaning process is intensive to ensure maximum soil removal and is achieved as above by using a weighted rotary floor cleaning machine, along with Tile Doctors restoration floor pads. 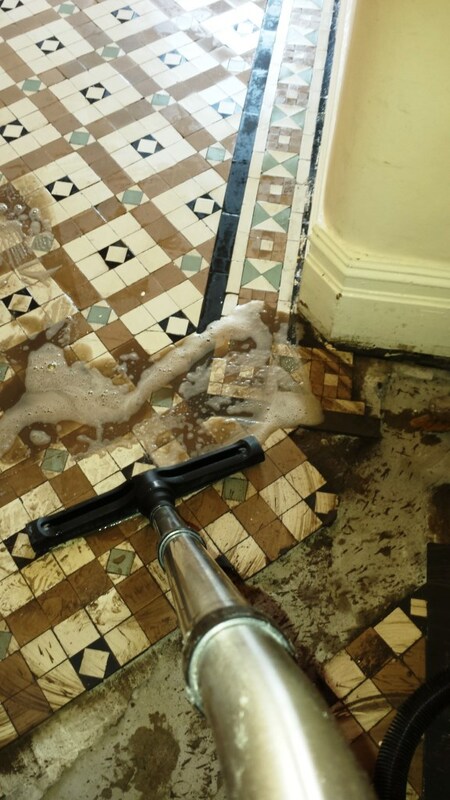 The resulting slurry created by the cleaning process above is vacuumed away with a wet vacuum and the floor was then rinsed with a dilution of Tile Doctors Grout Clean-Up product which removes any inherent efflorescence contamination that is common on old floors without damp proof membranes. The floor is then given a thorough rinse with clean water to neutralise the floor and removing any trace of cleaning solution from the previous treatments which could affect the sealer, again a wet vacuum was used to get the floor as dry as possible. The cleaning was completed in a day and to ensure the floor would be dry for sealing the next day I installed a couple of air movers and left it to dry out overnight. The following day I sealed the tiles to saturation point with Tile Doctor Colour Grow which is a ‘Colour Enhancing’ Impregnating Sealer. It’s an advanced sealer that allows the floor to breath, and also protects from both water and oil based spills and if maintained correctly will act as a long lasting treatment that will last many years! With regards to maintenance I recommend that customers use a damp mop with a neutral PH cleaning product such as Tile Doctor Neutral Cleaner. This is highly effective on soiling but most importantly it’s not acidic and so will not damage the integrity of the sealer. Many household cleaning products, and also high-street branded cleaning products, can quickly damage floor coatings; they can also leave residues on floors that contribute to rapid re-soiling. 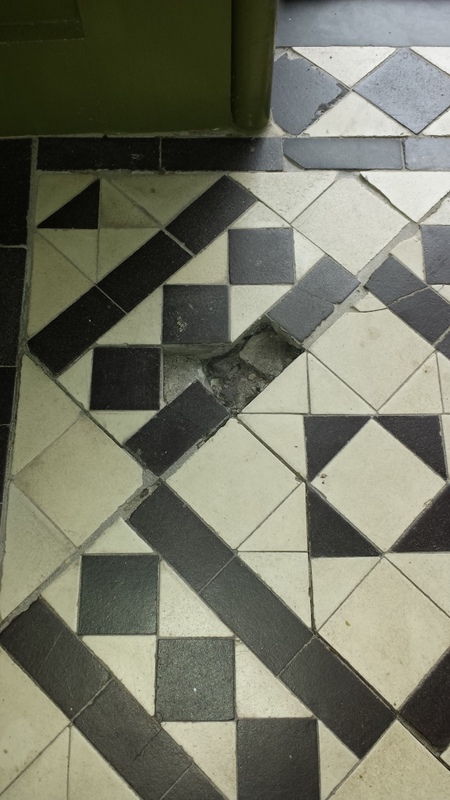 I’ve seen a few Victorian Tiled floors in my time and I can tell you the condition of this particular floor was one of the worst I’ve seen in a while. The tiles had been covered up with carpet tiles which had been stuck down with a strong adhesive and there was still a fair amount of carpet tile backing that needed removing, grout was also missing in places and I could see a fair amount of work would need to be done to get this floor restored. The first job was to clean what I could of the floor and remove the remaining carpet tile so working in sections I applied Tile Doctor Pro-Clean and scrubbed it into the tiles carefully scraping off the tile backing as I went. There were a lot of tiles to cover so as you can imagine this was quite a painstaking process and I was literally working on one time at a time to get the job done. Once complete the floor was given a thorough rinse to remove any cleaning products and soiled cleaning solution which was then removed using a wet vacuum. Once the floor was clean it was evident that some tiles were loose and needed resetting and others would need grouting so I set about doing this making sure to use a matching grout. 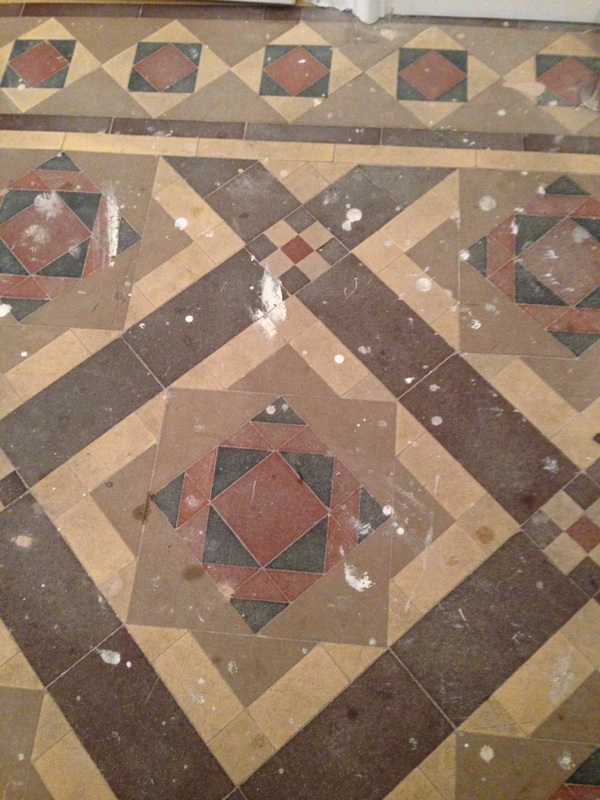 I left the floor to dry overnight and came back the next day to seal the tiles. Fortunately they had dried overnight so I applied four coats of Tile Doctor Seal & Go. 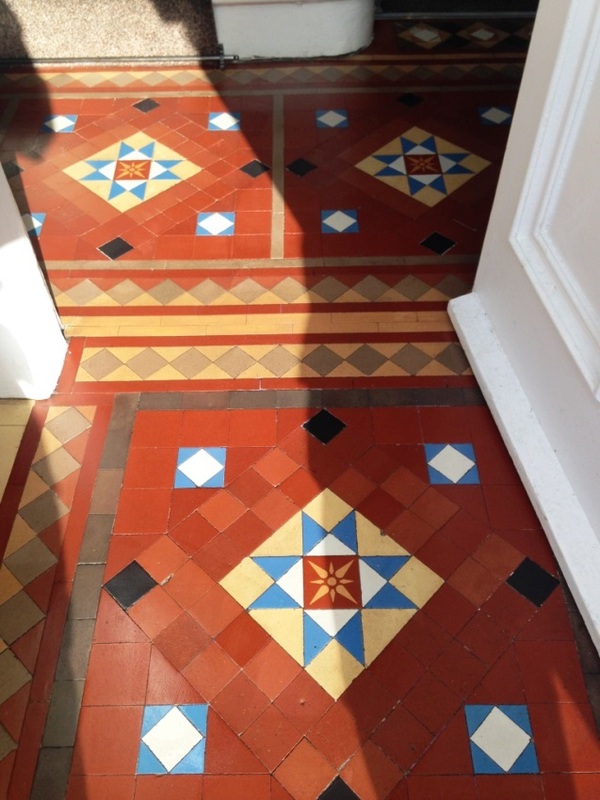 This is an ideal sealer for Victorian tiles as it adds a classic shine to the floor and will provide good protection from stains going forward. 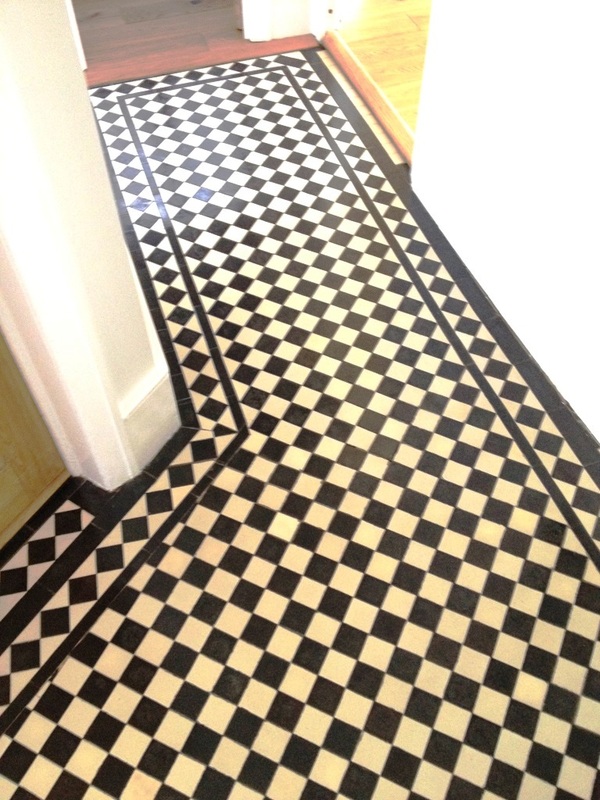 I think you will agree the floor has been transformed and now loos amazing, certainly the customer was very happy. 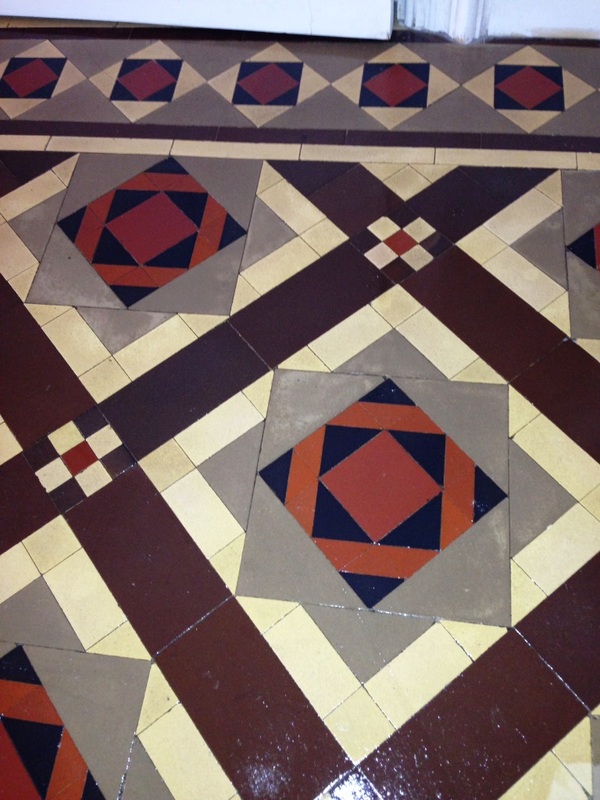 The Victorian tiled floor shown below comprised of a complex square and diamond pattern contained with a parallel border and must of take a lot of work when it was first installed. 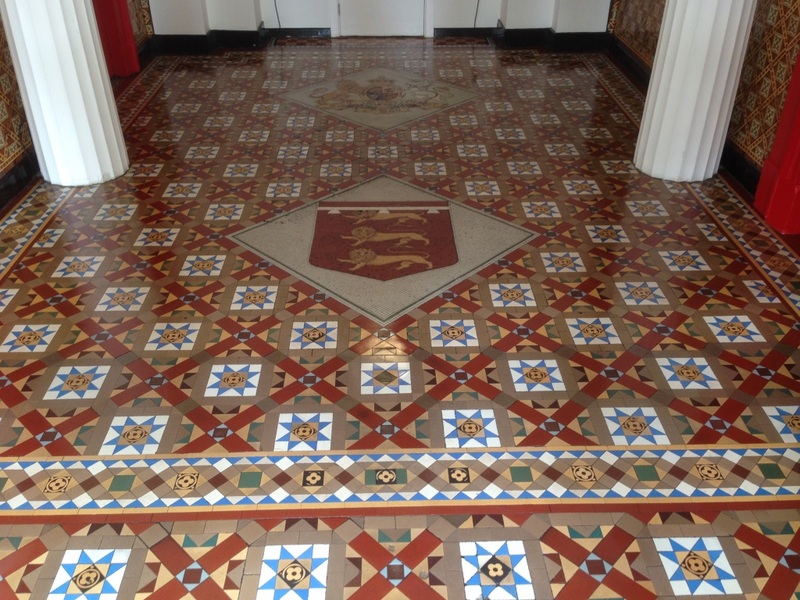 It had been a while since it was last given a deep clean and was now looking rather dull and lifeless; we come across a lot of these floors at Tile Doctor and the remedy is a straight forward deep clean and reseal. The first task was to clean the floor with a dilution of Tile Doctor Pro-Clean which was left to dwell on the tiles for a short while before being scrubbed in washing the floor down afterwards and extracting it with a wet vacuum to remove the soiled cleaning solution. 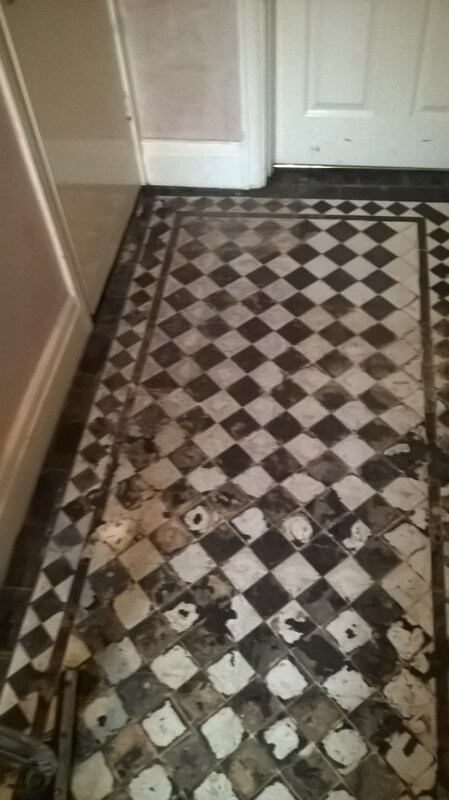 This did a reasonable job of cleaning up the tiles but there were some stubborn areas that would need further attention and what I suspected to be remnants of an old sealer. A stronger product was required and so the next step was to cover half the floor with Tile Doctor Remove & Go leave it to dwell for a time and then scrub the floor again with a rotary machine fitted with a scrubbing pad. 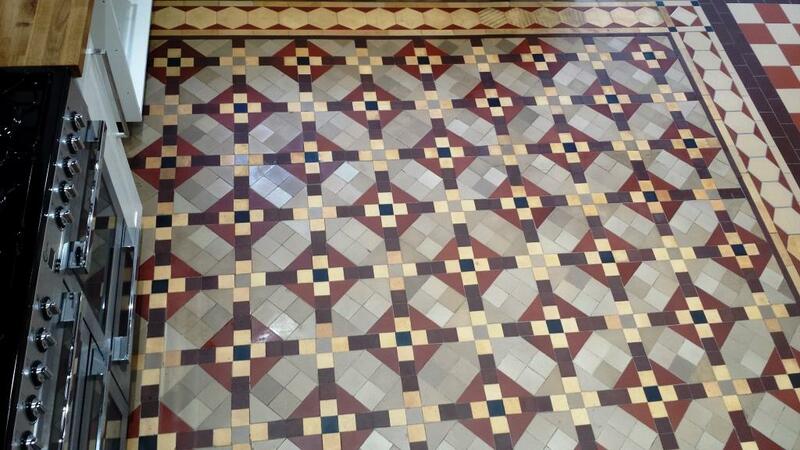 Again the tiles were rinsed and the dirty cleaning solution removed using a wet vacuum. Once done the process was repeated on the other half of the floor. Working in sections like this allows more room in what was a tight hallway and also ensures the cleaning products don’t dry out. This process removed all the old seal and drew out the ingrained dirt. I them rinsed the floor with a dilution of Tile Doctor Grout Clean Up to deal with a few stains and grout problems before removing it with the wet vacuum and giving the entire floor a thorough rinse with water which was repeated a couple of times; again the wet vacuum was used to extract the water from the tiles and get them as dry as possible. I had finished cleaning the floor and so left for the evening returning four days later to seal the floor. 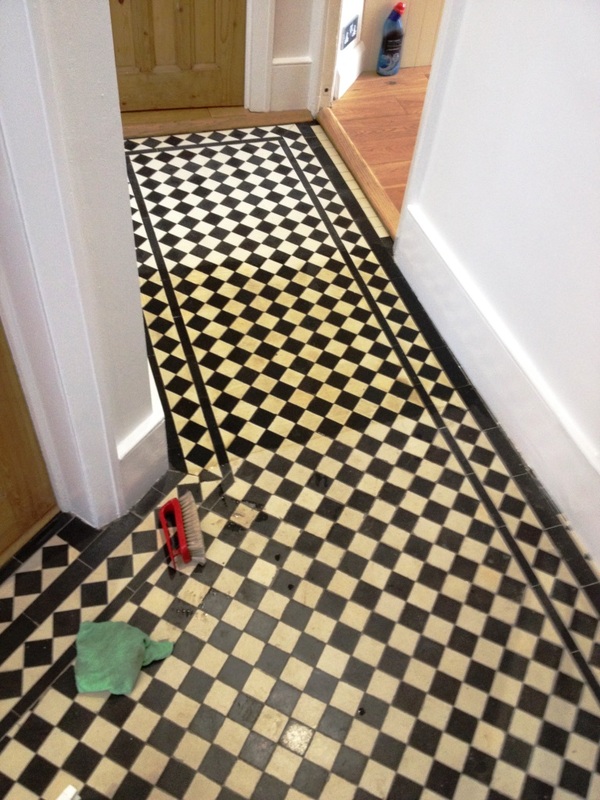 Fortunately the customer had planned a short break away so the tiles were nice and dry and still clean on my return. To seal I applied a single coat of Tile Doctor Colour Grow which is an impregnating sealer to give a good base followed by three coats of Tile Doctor Seal & Go which is a topical sealer that added the shine the customer required. 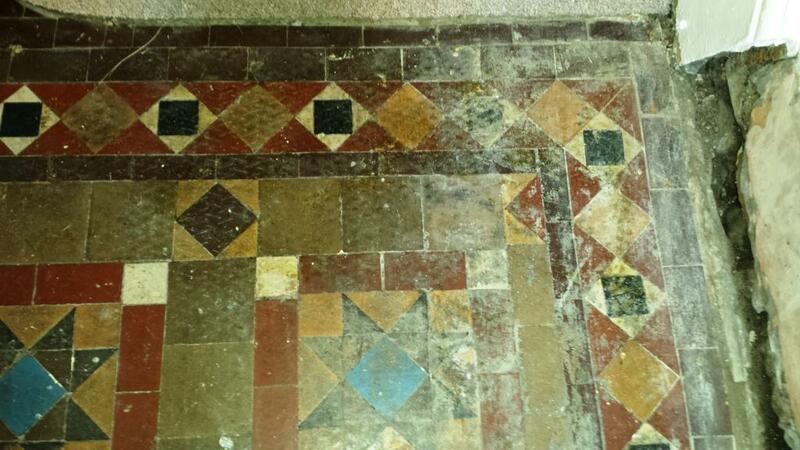 Apologies for the first photograph, I realise now it’s a little out of focus but hopefully you can see that the Victorian Tiled Floor pictured (at a residence in the market town of Farringdon, Oxfordshire) was not looking its best and this was mainly due to the fact that the house had recently undergone some extensive building work and had become very dirty in the process. The first thing I did was protect the skirting board and doors from splashes and then to clean the floor I applied a strong dilution of Tile Doctor Pro Clean and this was left to dwell on the floor for a good twenty minutes. It was then worked into the tile using a deck brush and then more Pro-Clean was applied so the floor didn’t dry. I then scrubbed the floor with a rotary floor machine fitted with a scrubbing pad. After I finished the soiled cleaning solution was extracted using a wet vacuum and the whole floor was then rinsed with clean water to remove any trace of cleaning product. 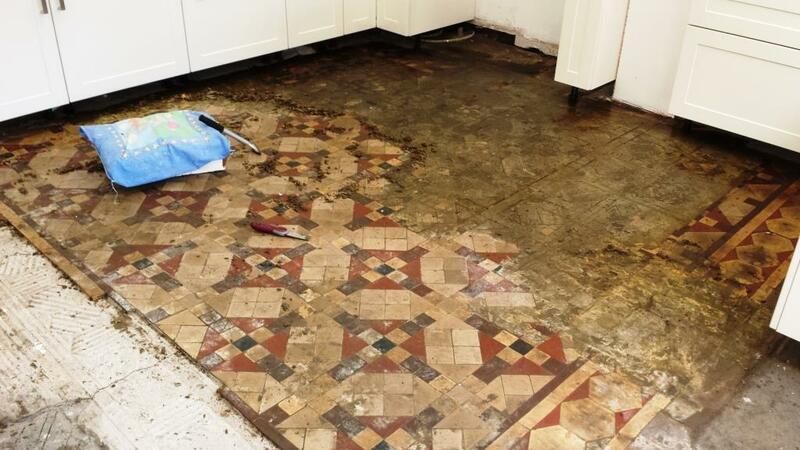 The tiles were then inspected and the process re-applied to areas that needed it; I then left the floor for two days so it could dry thoroughly. When I returned the floor was dry so I sealed it using a single coat of Tile Doctor Colour Grow followed by four coats of Tile Doctor Seal & Go. This is a great combination as the Colour Grow impregnates the tile improving the colours and protecting it from within whilst Seal and Go adds a further layer of protection and also added a nice subtle shine that the customer wanted. 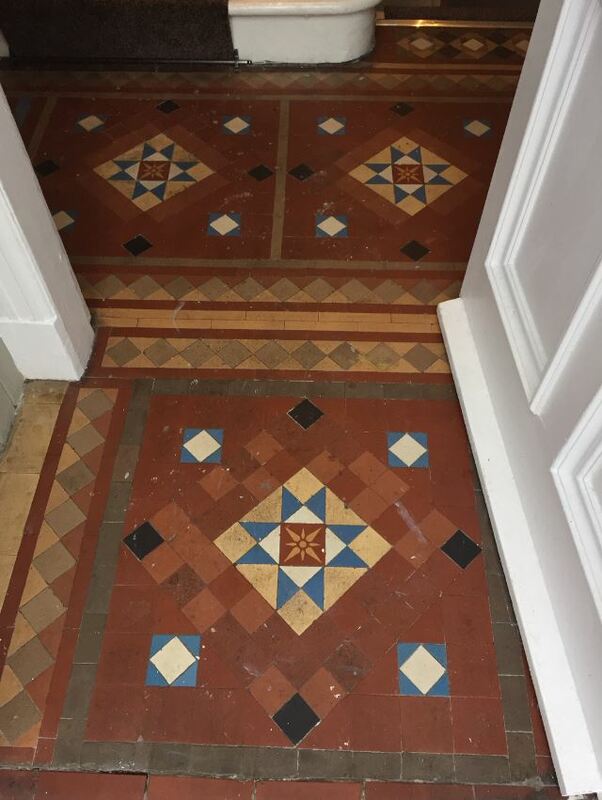 This dull and un-inviting Victorian tiled entrance hall was located at a house in the small town of Whitburn in West Lothian which is half between Glasgow and Edinburgh. 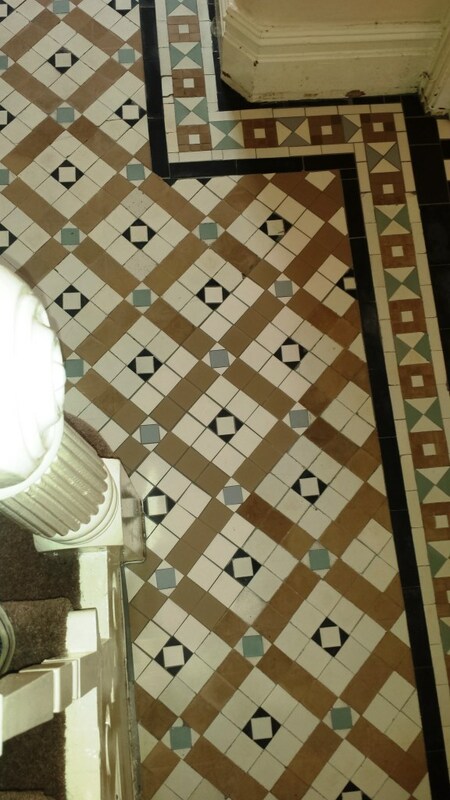 The tiles were in need of a deep clean and seal and we do see our fair share of Victorian tiled floors in this area and so have become quite experienced in their maintenance. To clean the floor and remove any remaining sealer a strong dilution of Tile Doctor Pro-Clean was applied to the floor and left to soak into the tiles for around fifteen minutes before being worked into the tile and grout using a black scrubbing pad fitted to a rotary bonnet machine. Pro-Clean is a heavy duty alkaline cleaning product that un-like acid based cleaners are safe to use on Tile, Stone and Grout. 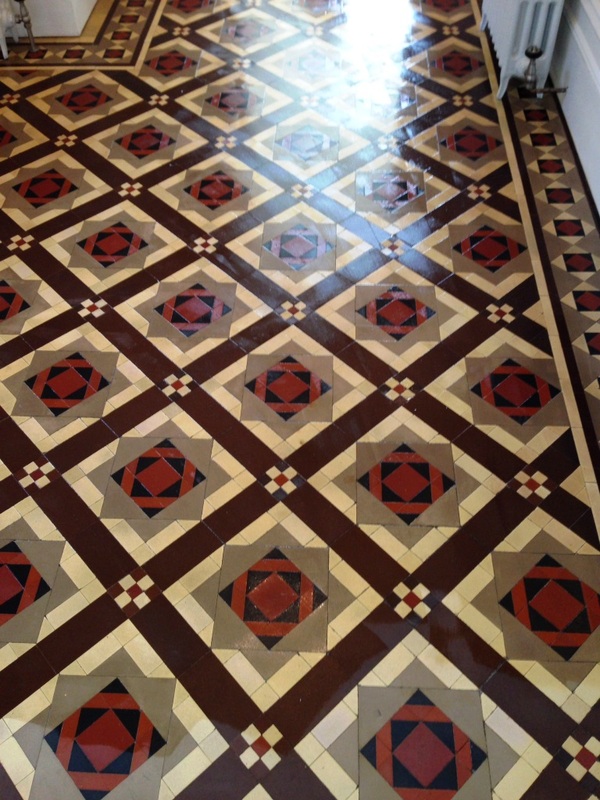 The soiled cleaning solution was then rinsed off using water and then the whole process repeated; three times to ensure any remaining sealer was removed and the floor was clean. The final step was to neutralise the floor before sealing which we did by giving it a final wash with Tile Doctor Neutral Tile Cleaner, this time we extracted as much water as possible using a wet vacuum and then left the tile to dry off overnight. We came back the next day and after checking the floor was clean and dry proceeded to seal the tiles using five coats of Tile Doctor Seal and Go. Seal and Go is a water based sealer so it doesn’t leave a smell as its drying, it also offers good stain protection and adds a nice sheen to the floor. 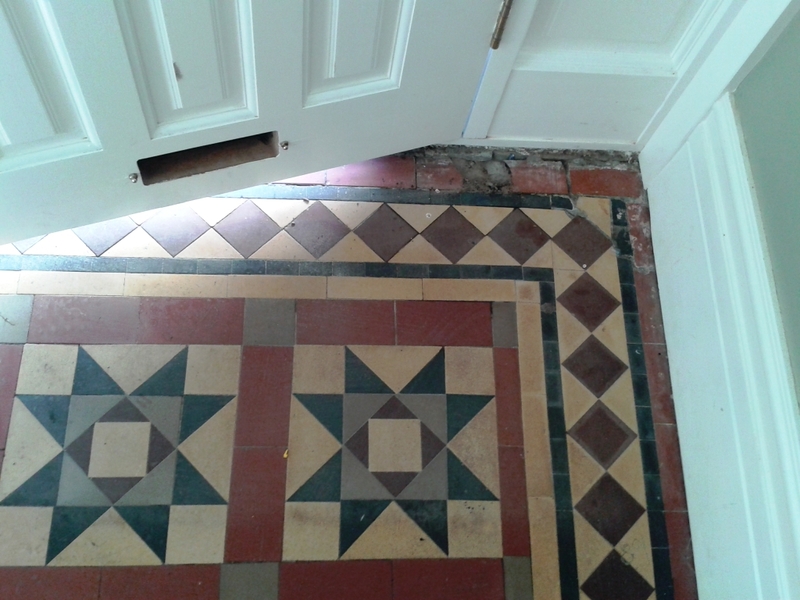 The entrance tiles now look new again and the sealer should keep it that way for a long time to come. 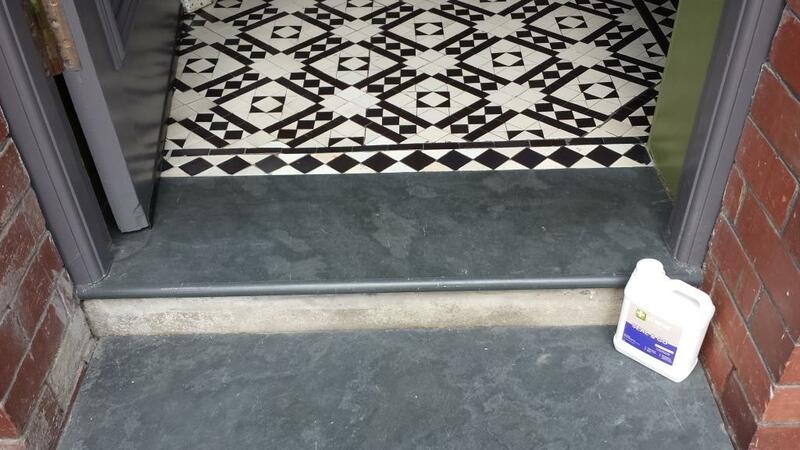 Similar in many ways to Victorian tiles, these are Moroccan Encaustic Cement tiles which come in a huge range of patterns and are ideal for indoor and external use although they should be sealed to protect against water penetration and dirt as well as making cleaning easier. Very popular in hot countries, they certainly add a nice flair which they have done to this ground floor WC at residence in Barrhead which is a town south west of Glasgow in East Renfrewshire. The tiles were looking rather dull and in need of a deep clean and re-seal so the first job was to clean the floor and remove and remaining sealer by applying a strong solution of Tile Doctor Pro-Clean worked in using a black scrubbing pad fitted to a rotary bonnet machine, with all the excess extracted using a wet vacuum. 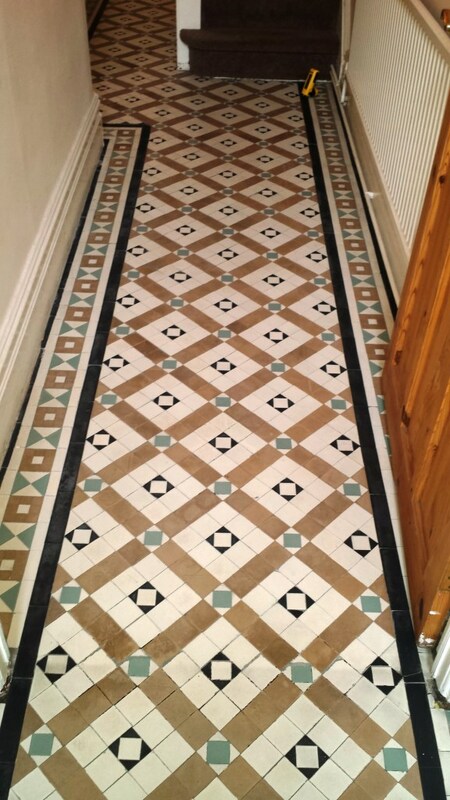 This process was repeated three times until I was satisfied any remaining sealer had been removed and the tile and grout was now as clean as it could be. The floor was then given a rinse with water and cleaned again with Tile Doctor Neutral Tile Cleaner to remove any trace of Pro-Clean; again the fluids were extracted using a wet vacuum. The floor was left to dry overnight and we came back the next day to seal it using six coats of Tile Doctor Seal and Go which works well on these types of tiles as it adds a nice subtle sheen as well as adding the necessary stain protection. 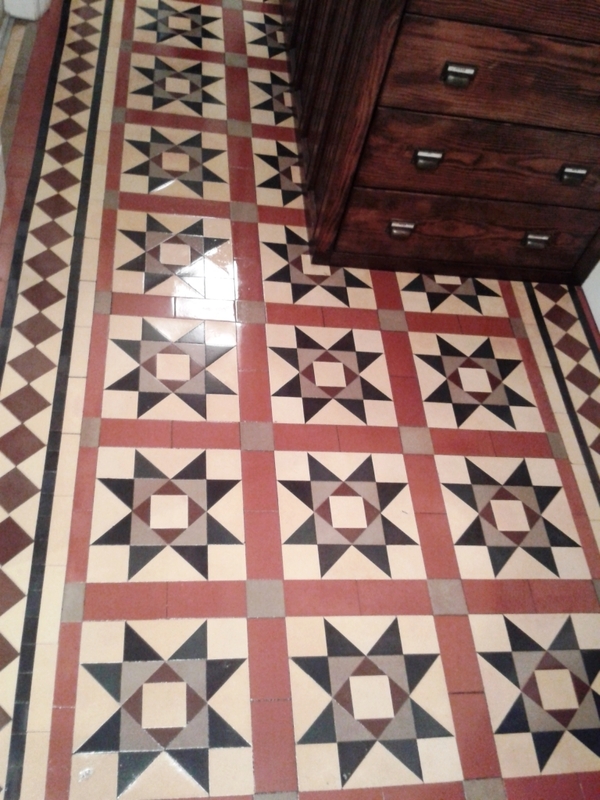 We had a great result on this Victorian tiled floor at a house in Musselburgh which is five miles east of Edinburgh and apparently one of the oldest towns in Scotland. 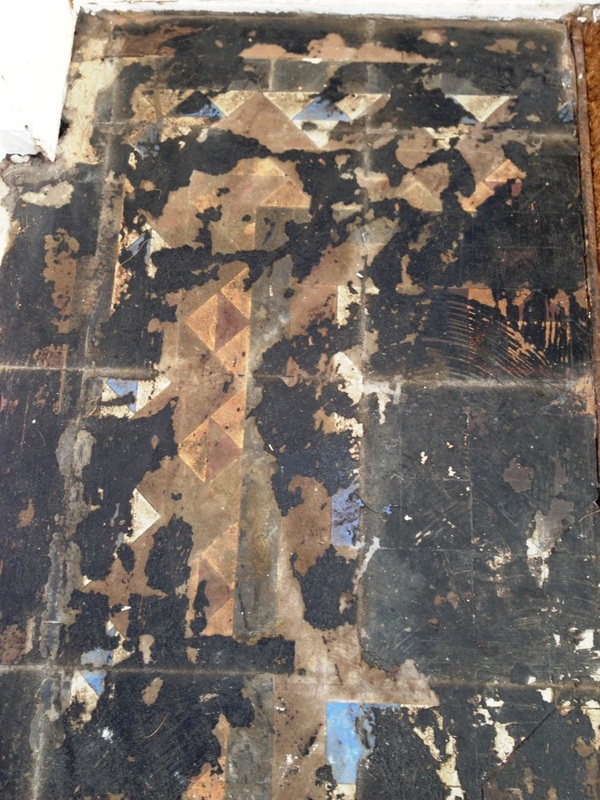 If you take a close look at the photograph below you can see how dirty the tiles were before we got started. We were quite lucky with the floor in that it was in good physical shape and really just need a deep clean and re-seal. 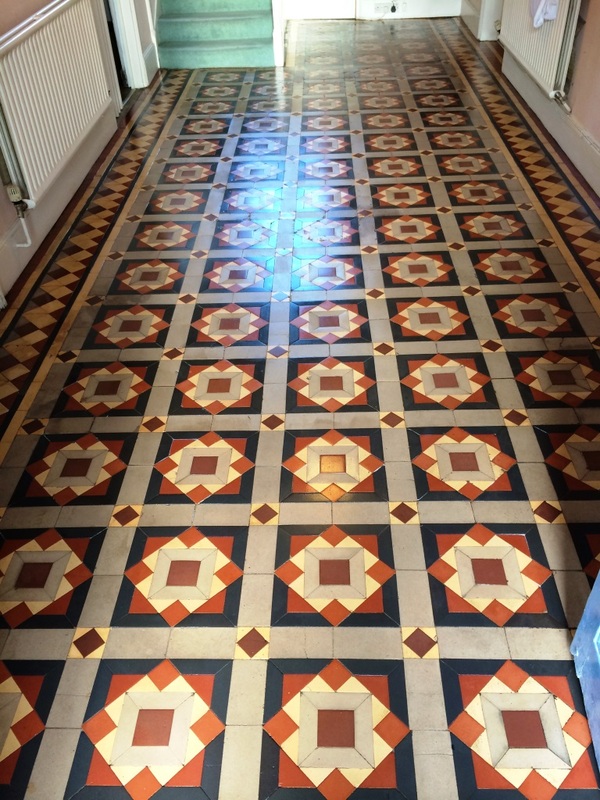 So the first step was to strip of any old remaining sealer or other coatings from the tiles using a strong solution of Tile Doctor Pro-Clean which is safe to use on these old tiles. The solution was mopped onto the tile and grout and then scrubbed in using a rotary bonnet machines fitted with a black scrubbing pad. The soiled cleaning solution was then rinsed off using water and then the whole process repeated; three times in fact before being satisfied that the floor was clean. The floor was given a final rinse using Neutral Tile cleaner and then water extracted using a wet vacuum before being left to dry overnight. We came back the next day and checked a few areas to make sure the floor was dry before sealing. 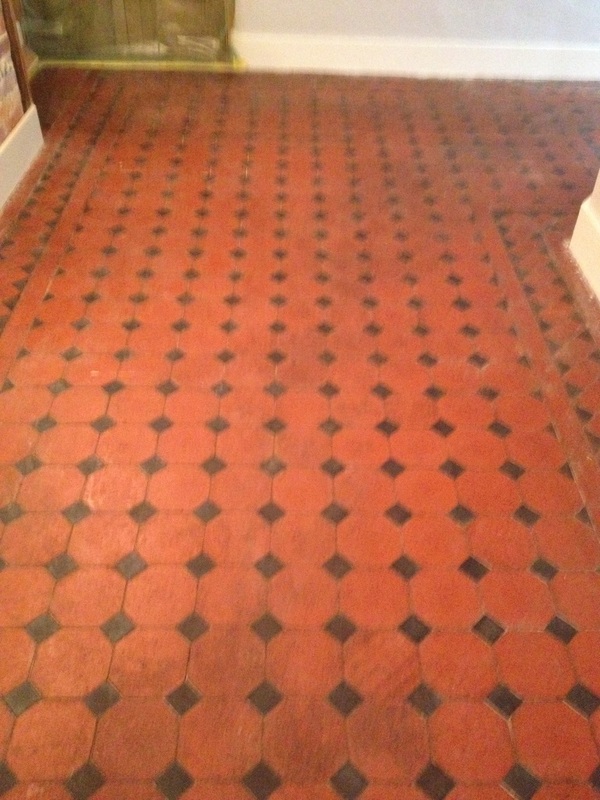 The tiles were dry so the sealing process was started using Tile Doctor Seal and Go which is an ideal sealer for Victorian Tiles as it affords good stain protection whilst adding a nice subtle sheen to the floor, five coats were required before the tiles had become fully sealed. 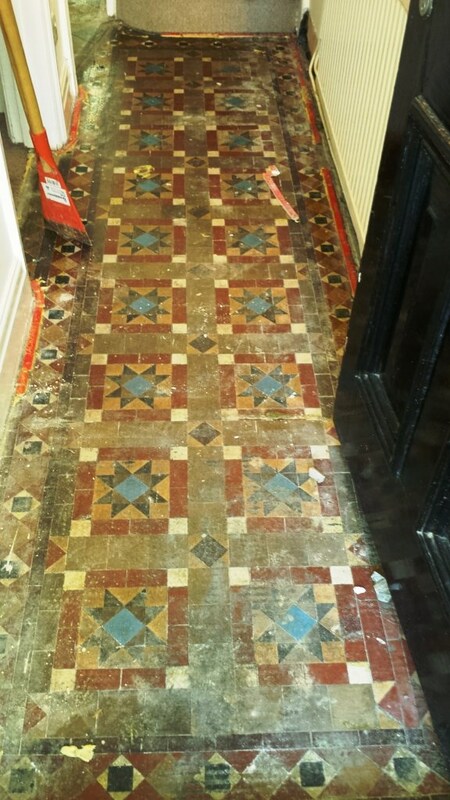 I think you will agree the tiles look transformed and the sealer should keep them looking that way for some time to come. We were contacted by a letting agent who managed a large town house in Goring by Sea that had been turned into flats. 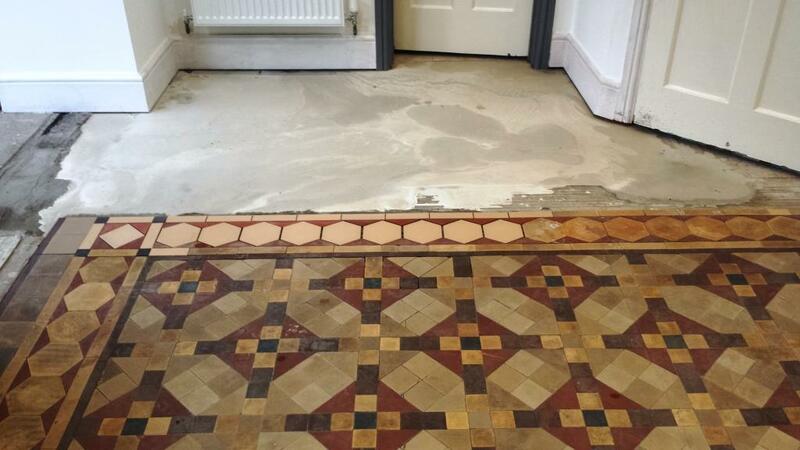 The area they wanted dealing with was the entrance hall where the original Victorian tiled floor had been covered over with linoleum tiles backed with a bitumen based adhesive and after removing the tiles the floor was now in a terrible state. I was confident that they could be restored however in extreme cases like this there can be no guarantee of the end result so I set their expectations accordingly. I started the job by softening the old adhesive with an application of Tile Doctor Remove and Go which was left to soak into the tile before using a paint stripping blade to carefully lift it off. This process had to be done over the entire area before I could start on the cleaning and once finished the floor was given a good rinse. The tiles were now mostly free of the adhesive but were very grubby so I started over but this by time by applying a strong dilution of Tile Doctor Pro-Clean which is a powerful tile cleaning product designed for use on stone, tile and grout. The solution was left to soak into the tile before being worked into the remaining dirt and grime using a buffing machine fitted with a scrubbing pad. One done the floor was thoroughly rinsed and any areas that needed it were spot treated. The floor was left to dry out for a few days after which we came back to seal it with four coats of Tile Doctor Pro-Seal which is a penetrating sealer which gave the desired natural look finish and will provide long lasting stain protection by soaking into the pores of the tile and preventing dirt from becoming ingrained there. You have to wait for each coat to dry before moving on to the next so it did take a while. This was a tough job but certainly well worth the effort both the letting agents and residents all said how great the floor now looked. 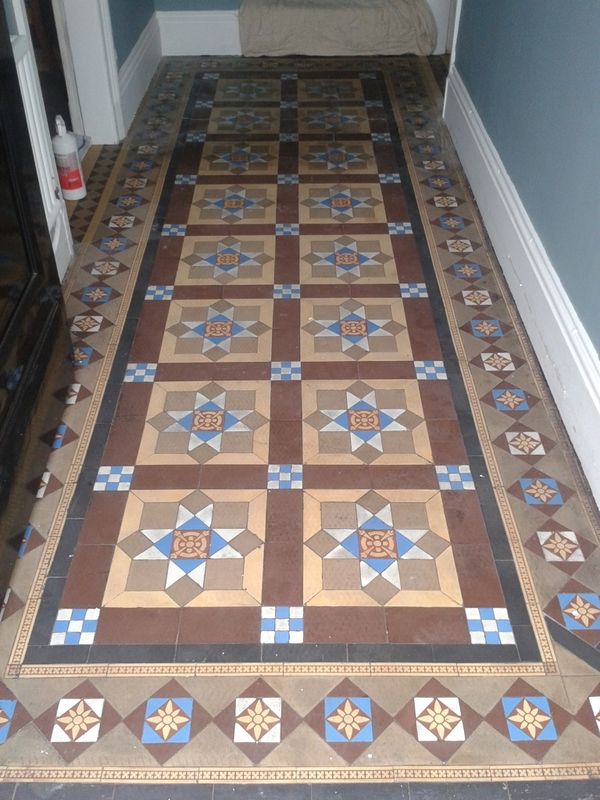 This Victorian Tiled Floor was in the hallway of a house in Melton Mowbray which is famous for its pork pies and historic buildings, although structurally sound it has been some time since it had been given a deep clean and re-seal and was now looking rather dull and lifeless. To remove the old sealer and give the floor a thorough clean I applied a dilution of Tile Doctor Remove and Go and left it for about twenty minutes to soak in to the tiles and get to work on breaking down the sealer. 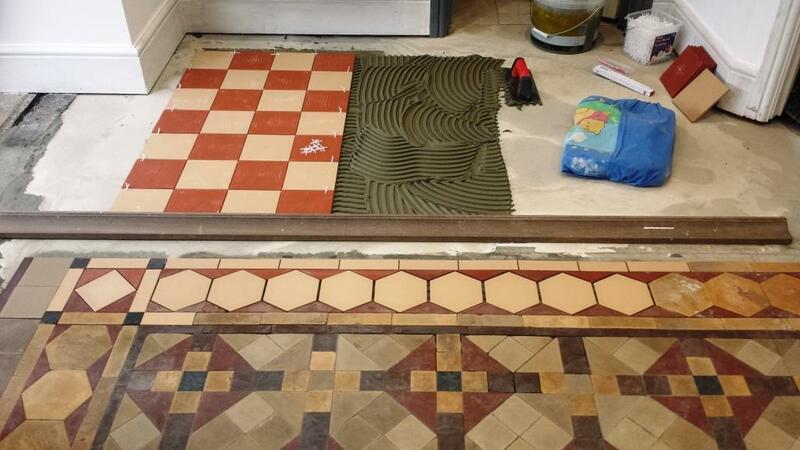 This was followed by scrubbing the solution into the tiles using a rotary machine fitted with a black scrubbing pad. I also took the opportunity to freshen the grout by scrubbing the Remove and Go along the grout lines with a stiff brush. The resultant soiled cleaning solution was then rinsed away with fresh water which was then removed using a wet vacuum. Some areas needed further treatment so the whole process was repeated until I was happy with the condition of the floor, at which point I give it another rinse to ensure there would be no trace of cleaning product on the tiles that could react with the sealer. I then removed as much water from the floor as best as I could with the wet vacuum and then left it to dry off overnight. 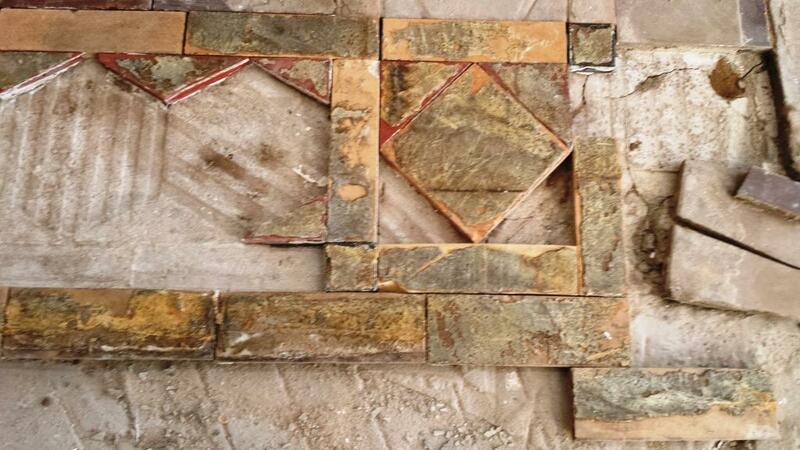 I came back the next day to check the tiles had dried; it had so I started the application of the sealer. 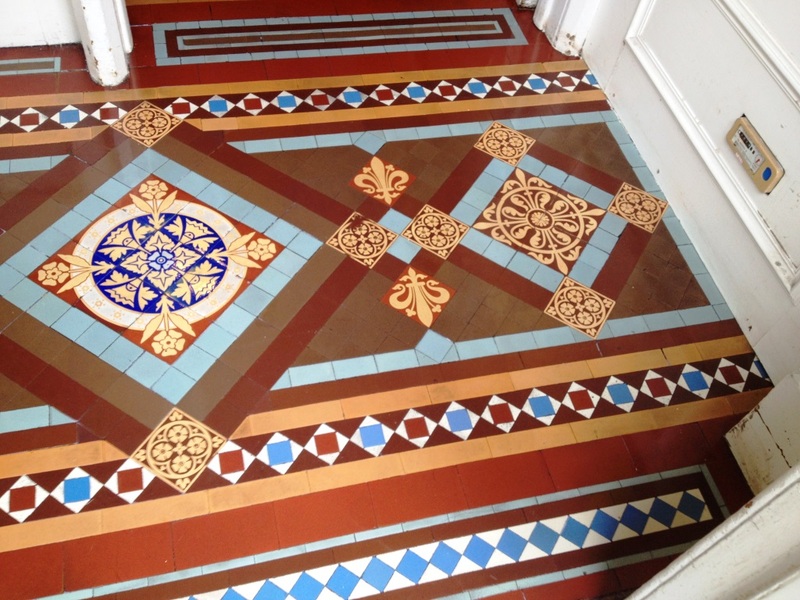 For Victorian Tiles I usually recommend Tile Doctor Seal and Go for a shiny finish or Colour Grow for a more subtle effect. The customer chose Colour Grow which is an impregnating sealer that soaks into the pores in the tile preventing dirt from becoming ingrained there and also enhances the natural colours in the tile. The tiles now look much improved, if not new. 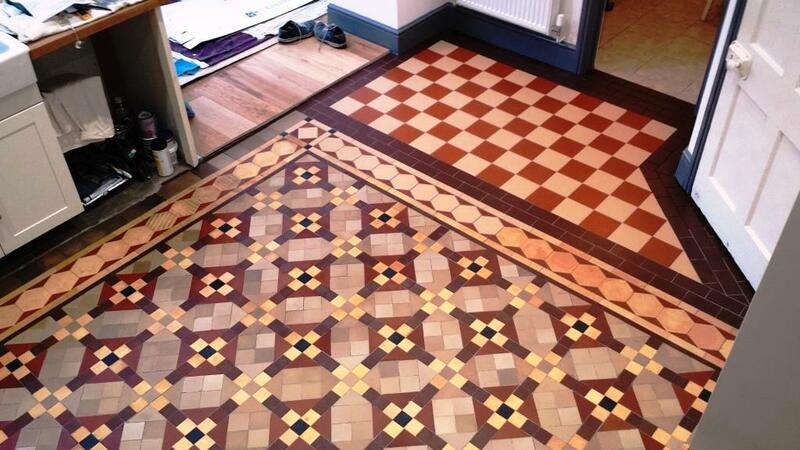 Details below of a Victorian Tiled floor I renovated in Penrith earlier this year. 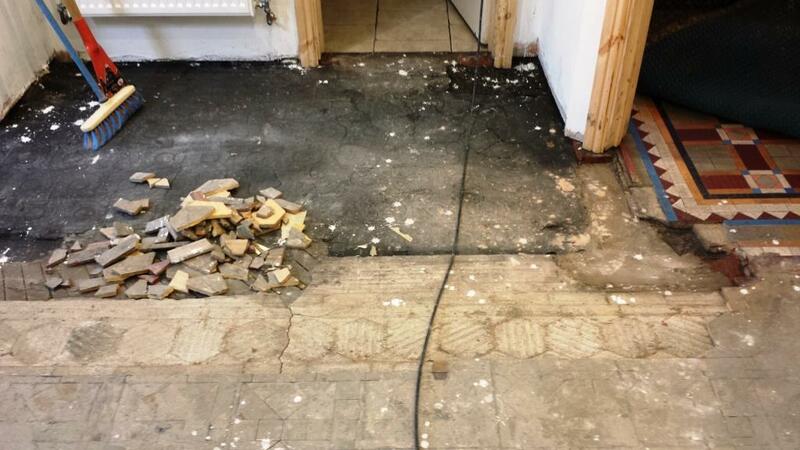 The floor had previously been hidden under laminate flooring and the mat well had been concreted over and other tiles were missing and replaced with concrete infill. 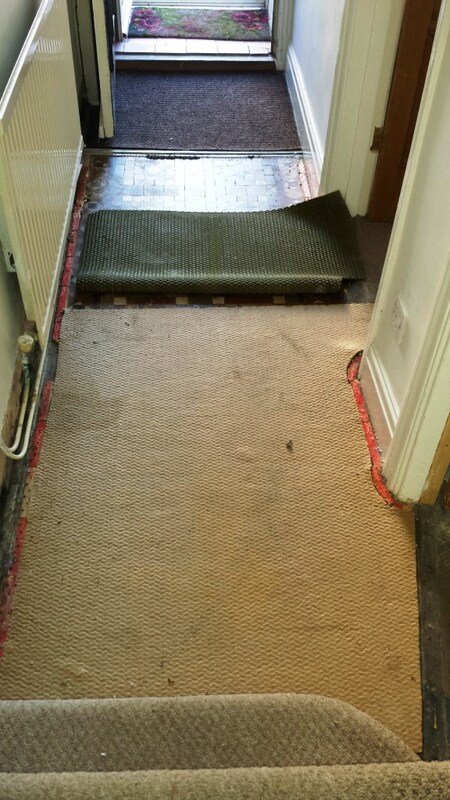 I carried out a damp test and started by removing the concrete infill and levelling the mat well with a self-levelling compound. 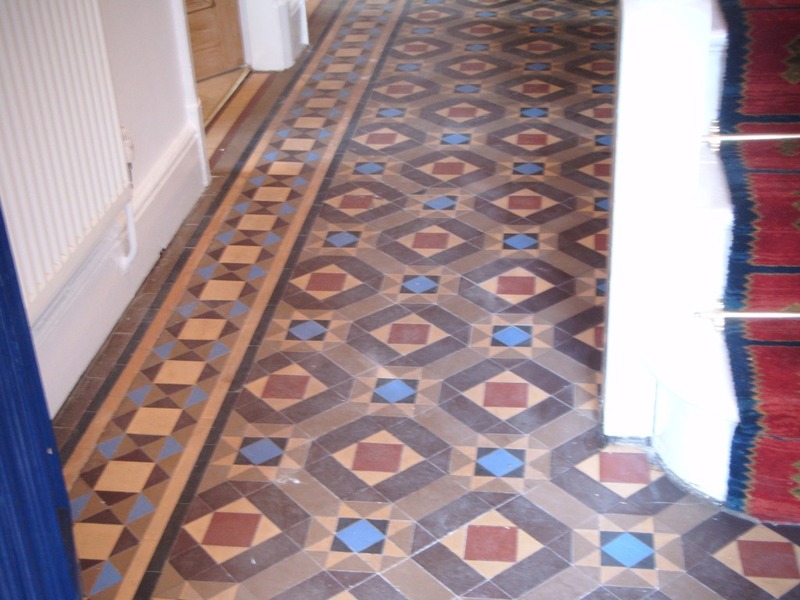 Fortunately I had been able to source reproduction tiles that were a pretty good match to the originals which is amazing bearing in mind that the floor was originally laid in 1831 (pre Victorian in fact). Before replacing the missing tiles I cleaned the existing floor with a diluted mixture of Tile Doctor Remove and Go and NanoTech UltraClean; Remove and Go is a coatings remover so as well as cleaning the floor it also removed the traces of adhesive that was used to stick down the line. I washed down the floor and found there were still some stubborn marks which I tackled with neat Remove and Go and a steam cleaner. 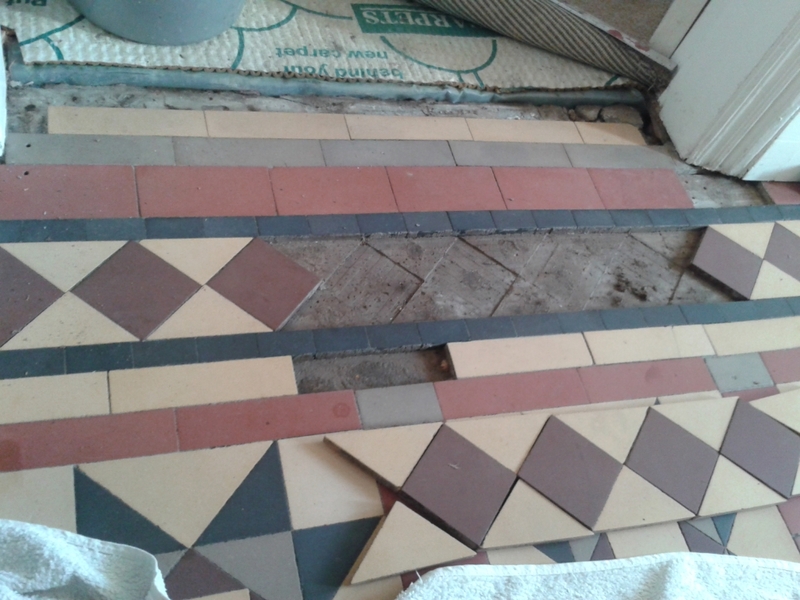 Once I was happy with the floor I gave it another rinse and then set about fixing the replacement tiles. I’m beginning to wonder if Tile Doctor has started a trend that has got people looking under their hallway carpets looking for period floors. 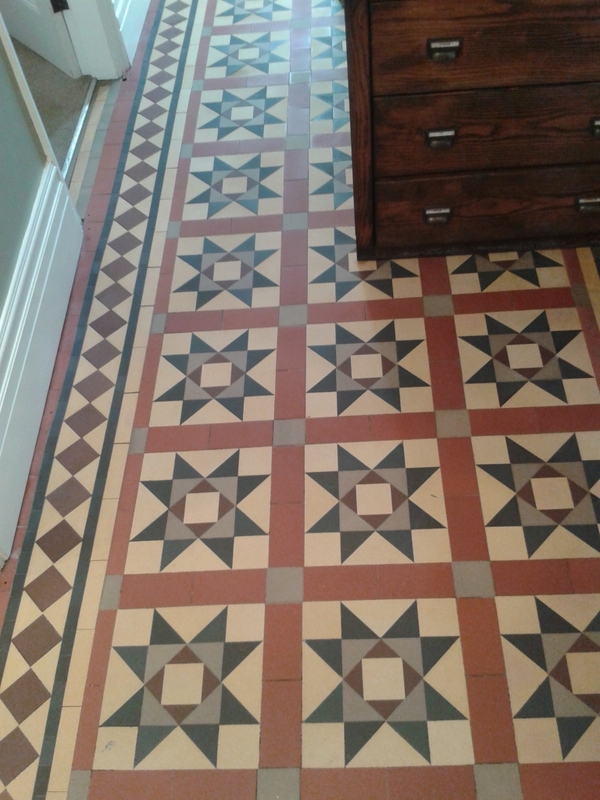 Indeed this customer in Whitchurch has done exactly that and discovered a beautiful Victorian tiled floor which was with the exception of adhesive residue and dirt was in reasonable condition. 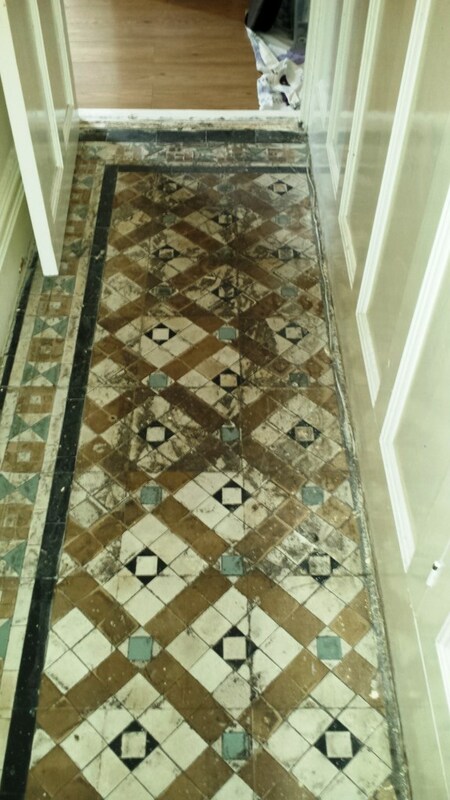 They had tried to restore it themselves but could not achieve the desired results so being their local Tile Doctor we got the call. The floor was dirty which I would normally take care of with Tile Doctor Pro-Clean however glue requires something stronger so a strong dilution of Tile Doctor Remove and Go was applied, left to soak in and then scrubbed into the tiles using a rotary machine fitted with a black scrubbing pad. 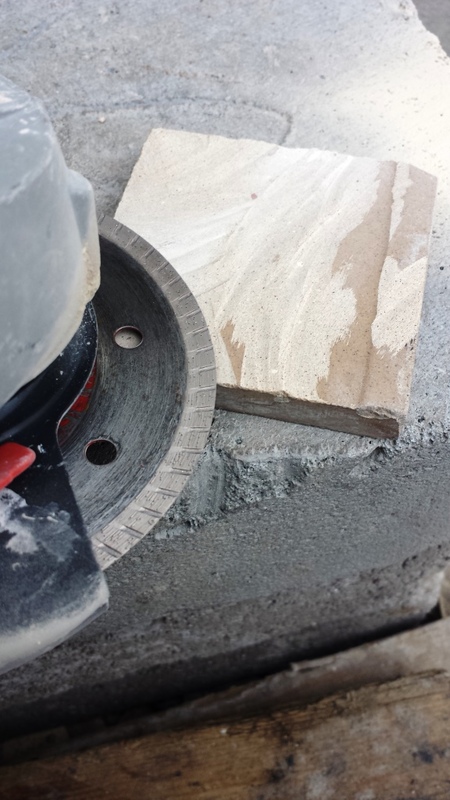 Remove and Go does pretty much what its name suggests and is a great product for safely removing coatings from tile. The floor was given a thorough rinse with clean water and a wet vacuum was used to remove the water from the floor and get it dry so it could be sealed. 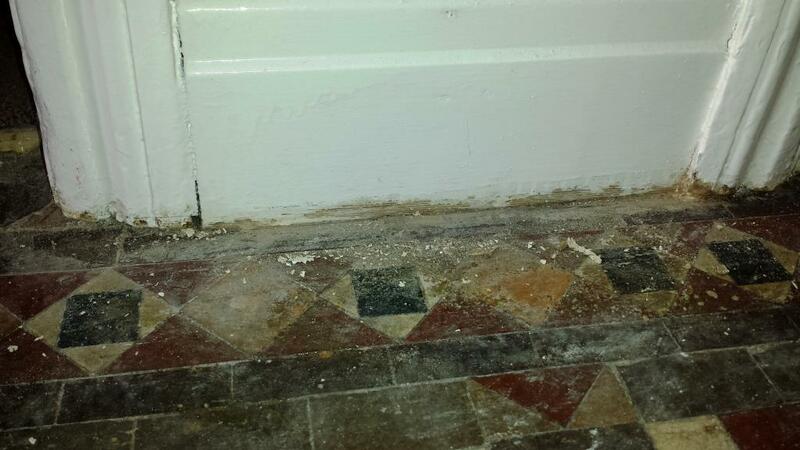 Some stubborn areas were still evident so they were spot treated using more Remove and Go. The floor needs to be thoroughly dry before it can be sealed and this can be a problem with old houses which may have damp issues. I therefore left the floor to dry for 5 days before coming back to seal it and when I returned checked the floor using a damp meter first. The readings were fine however there were a couple of areas that needed further treatment so those were spot treated and then dried until I was satisfied the floor was as good as it could be. I then processed to seal the floor using five coats of Tile Doctor Seal and Go which adds a nice subtle sheen to the tiles as well as providing stain protection going forward. I think you will agree from the photographs the floor looks great, certainly the customer was really pleased with the result. 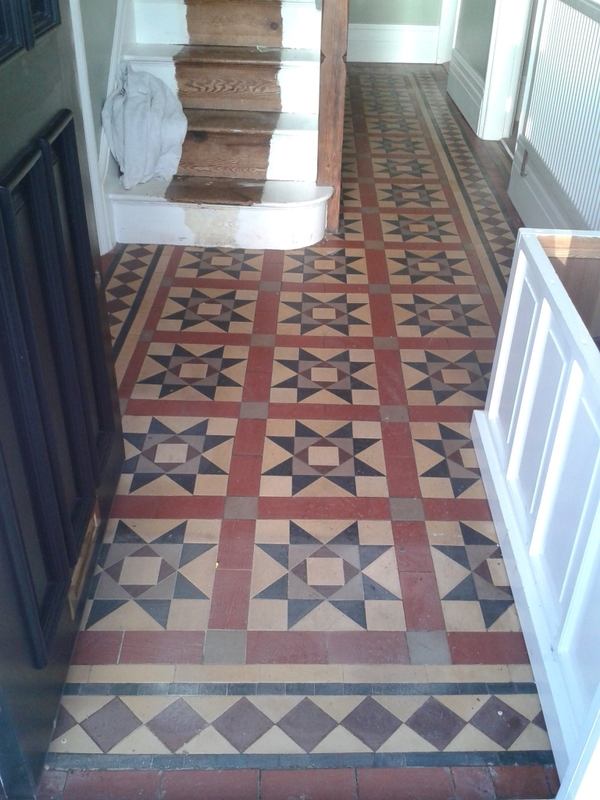 The pictures below are from a Victorian tiled floor installed in a period house in the coastal town Eastbourne. 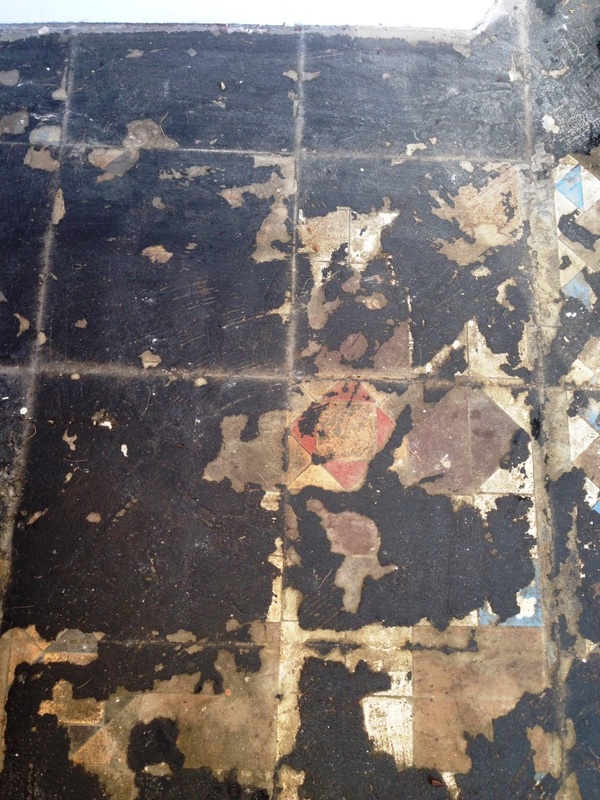 The tiles had been covered lino and carpet for years which the owner had only recently removed during renovation work, as it turns out this was unfortunate as they then became covered in plaster and paint from the decorators. 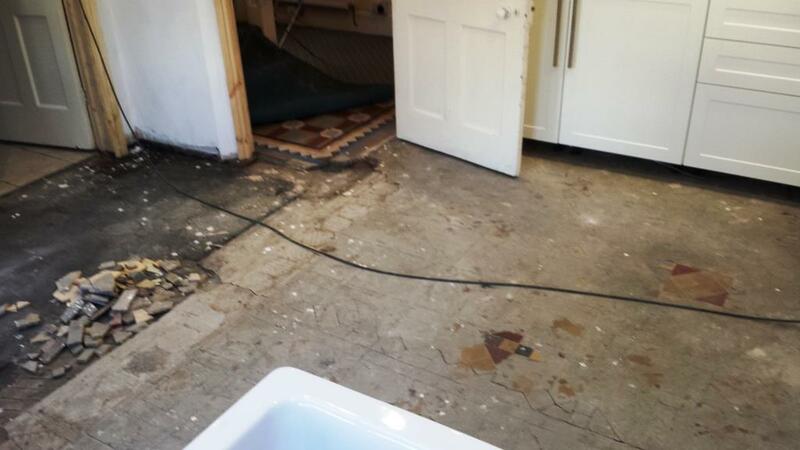 Although the floor did look to be in a very sorry state I was very confident that I could breathe new life into it given enough time so I allowed four days to complete the task. Some type of adhesive had been used to stick down the Lino and Carpet so the first step was to remove all the stubborn glue build up which I did using Tile Doctor Remove and Go, then once the bad areas had been targeted I concentrated on the plaster and paint build up which I treated using a 3-1 mix of Tile Doctor Pro-Clean in warm water worked in with a buffing machine fitted with a black scrubbing pad. The soiled water was rinsed away using a wet vacuum so the floor could be checked to see if more work was required which it was so stubborn areas that had resisted the initial cleaning onslaught were spot cleaned by using a diluted mix of Tile Doctor Grout Clean-up which is a very strong acidic product for removing grout and other mineral based substances from tiles. Before finishing the entire floor was given a thorough rinse to remove any trace of cleaning product, again a wet vacuum was used to remove the water and this time get the floor as dry as possible. The cleaning took place over two days and then the floor was given a further two days to allow it to dry fully after which I went back and sealed it with four coats of Tile Doctor Seal and Go which is an ideal sealer for Victorian tiles as it combines stain protection whilst giving the floor a subtle sheen appearance. Looking at the floor when the last coat went on it was hard to believe the state it was in when I first arrived. 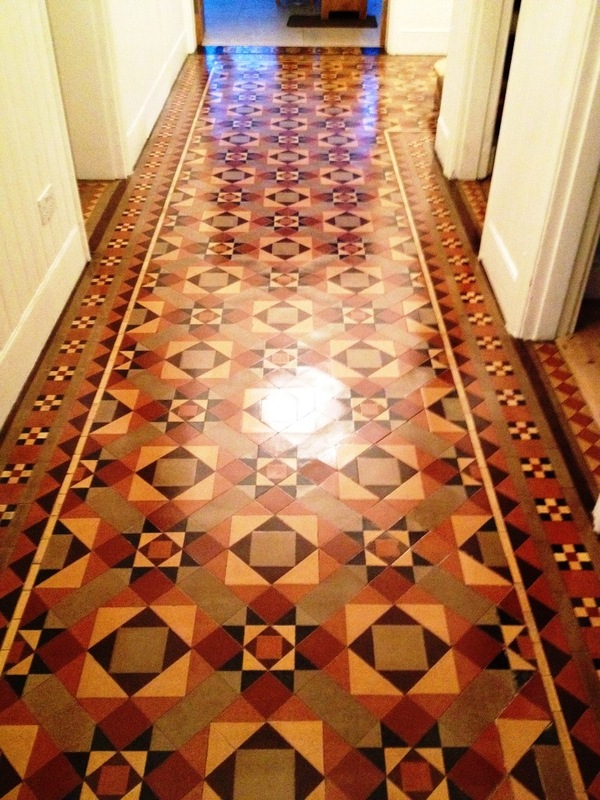 Incidentally the owner who had inherited the house told me that he had not seen the floor look that good when his parents were alive as he remembered it from his childhood. It always makes the job more worthwhile when you hear stories like that. 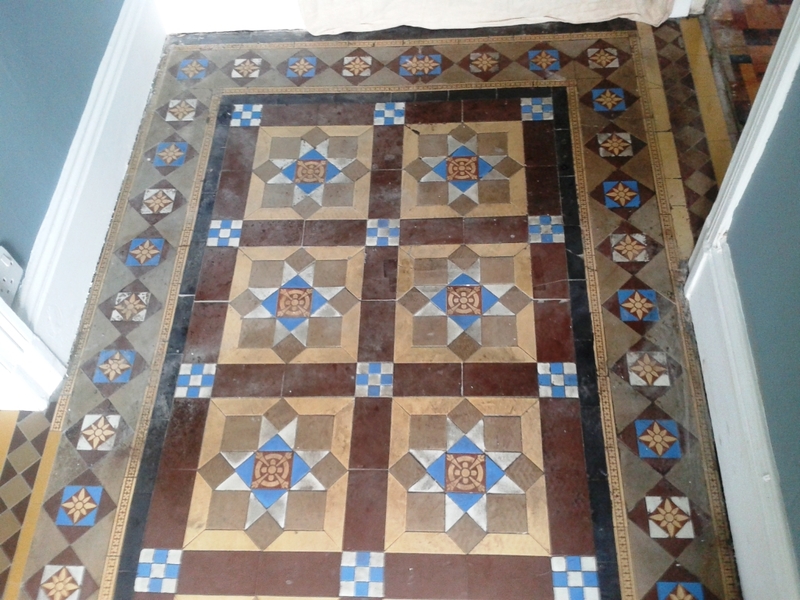 A customer in Port Talbot discovered an original but damaged Victorian Tiled Floor, circa 1890, hidden under laminate flooring in their hallway and were keen to restore it back to its original condition. 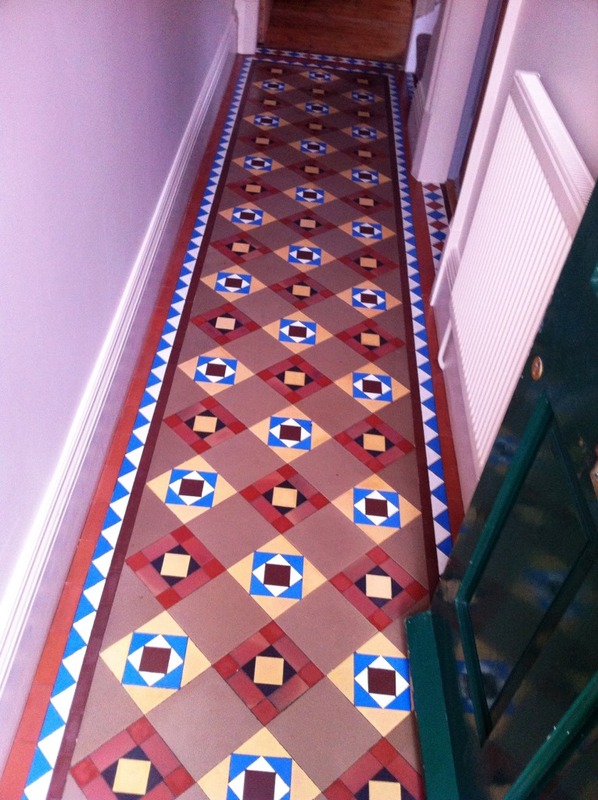 They trawled the Internet and discovered Tile Doctor, made contact and a visit was arranged to conduct a survey. 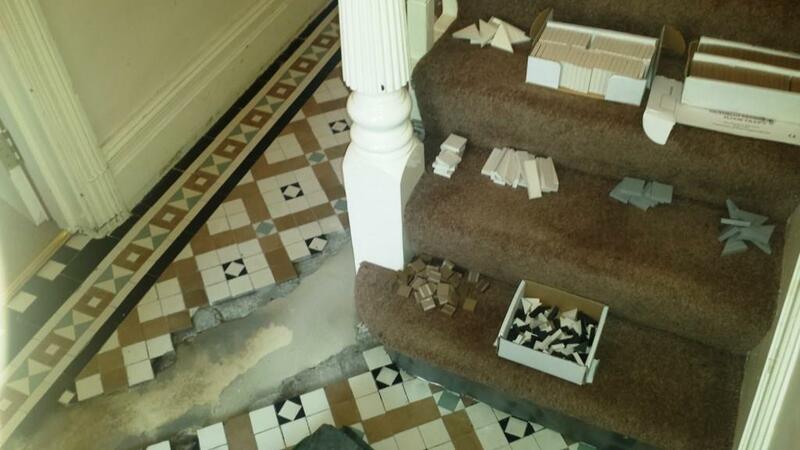 The Victorian floor tiles were in a poor condition and to make matters worse a central heating pipe had been laid through the width of the hallway floor destroying the Victorian tiles. 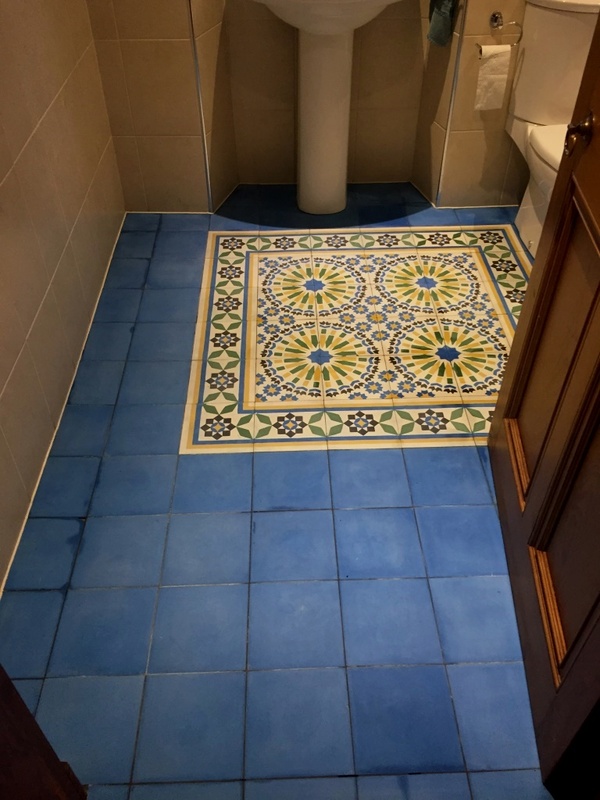 I assured the owners something could be done and we made a booking for me to return and do the work; in the meantime I spent a considerable amount of time sourcing tiles with the right measurements to replicate the original. 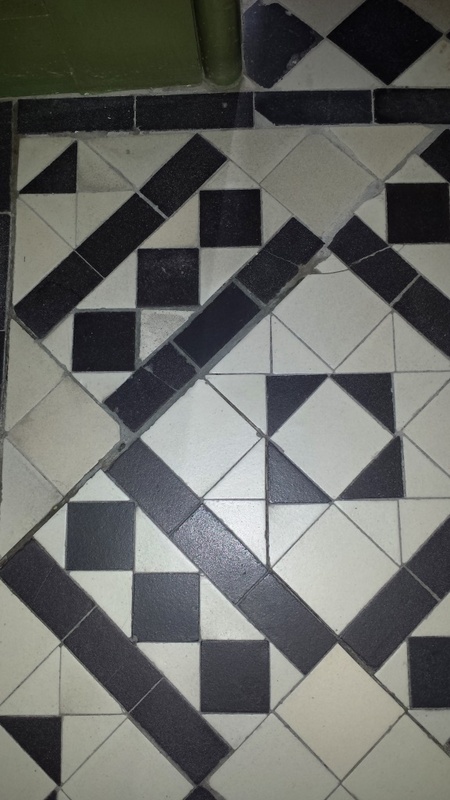 Fortunately I managed to find a close match with a tile supplier called Original Style. 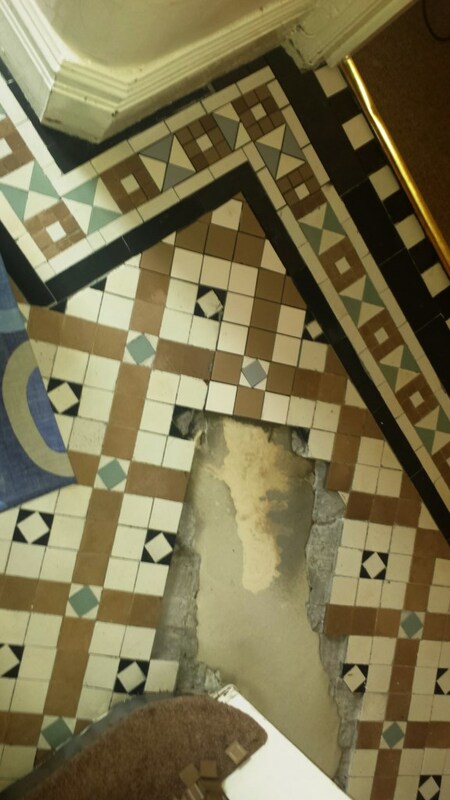 My first task was as always to check for moisture then to scrape as much adhesive and paint off the tiles as possible; then resorting to a chisel and small jackhammer tool around all the edges of the area to be replaced to remove any more badly damaged tiles. I could see from the start I was going to need all the assistance I could get to clean this floor and lifts the stains out so to deep clean the tiles I applied Tile Doctor Remove and Go mixed 50/50 with NanoTech UltraClean which adds fine abrasive particles to an already powerful coatings remover. I brushed the solution over the whole floor and then went over it with a rotary machine fitted with a black scrubbing pad. I then left it to soak in for at least an hour before going over it again with the machine. Next the floor was rinsed with water to remove the worst of the dirt and to enable further attention to be focused on the more stubborn stains. Further cleaning was required so I covered the tiles in Tile Doctor Pro Clean which is a strong alkaline cleaning product and then rinsed the floor again scrapping off any old paint and stubborn glue residue in the process. The floor was looking much improved but there were still areas with light cement smears and deeply ingrained dirt so this time I applied Tile Doctor Grout Clean-up which is an acid based product so you can’t leave it on too long but it’s the only effective way to treat mineral type deposits. I wanted to be sure all this product was removed so afterwards the floor was rinsed three times using a wet vacuum to remove the water. Once I was satisfied the floor was clean I applied a levelling compound to the area damaged by the heating pipes for the new base so I could tile it the following day. 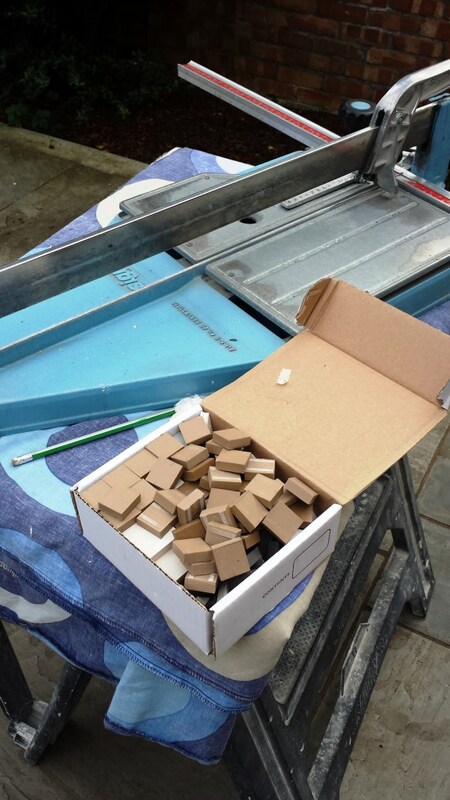 On the second day I started by cutting larger tiles into small pieces as the tiles were only certain sizes available from the tile supplier, but the colour match was nearly perfect so I made do. Next I started to tile the area using a fast setting adhesive so I could grout the tiles the same day. Once everything had set I gave the rest of the floor a final steam clean to make sure there was no trace of chemical that could upset a sealer. 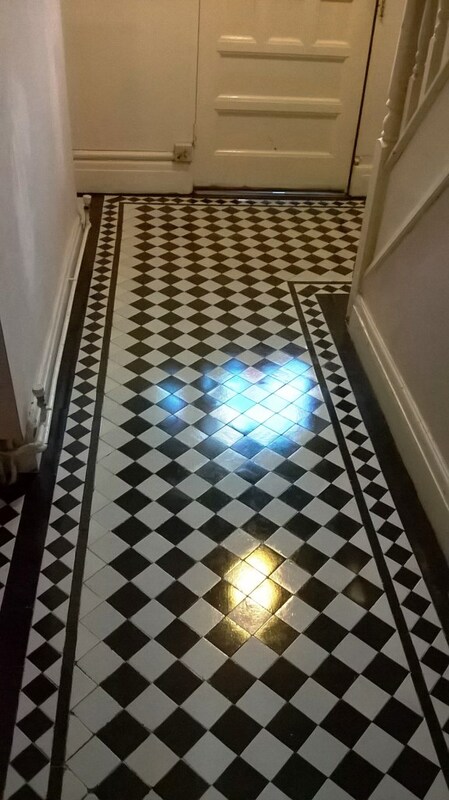 I left the floor to dry out over the weekend and then came back on the Monday to seal the tiles with Tile Doctor Seal and Go which is ideal for this type of tile as it adds a nice shine. I applied three coats leaving and interval in-between so it could dry before applying the next coat. 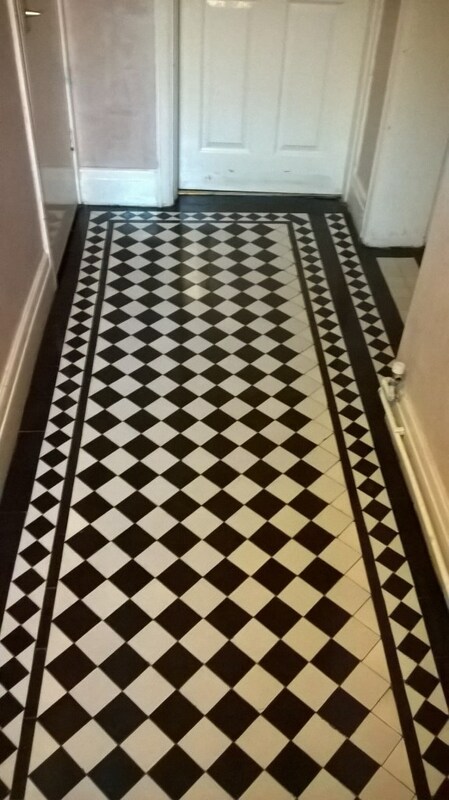 The customer was delighted with the results and that she chose Tile Doctor to do the work, we were not the cheapest quote she had received but you have to admit the floor looks like new so well worth the money. 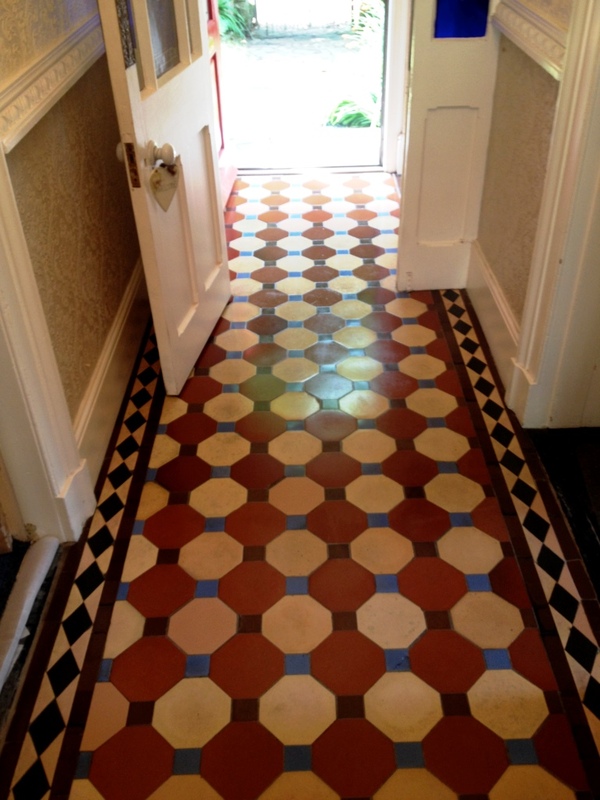 This Edwardian tiled stone floor was installed in the hallway of a house in Richmond, Surrey. 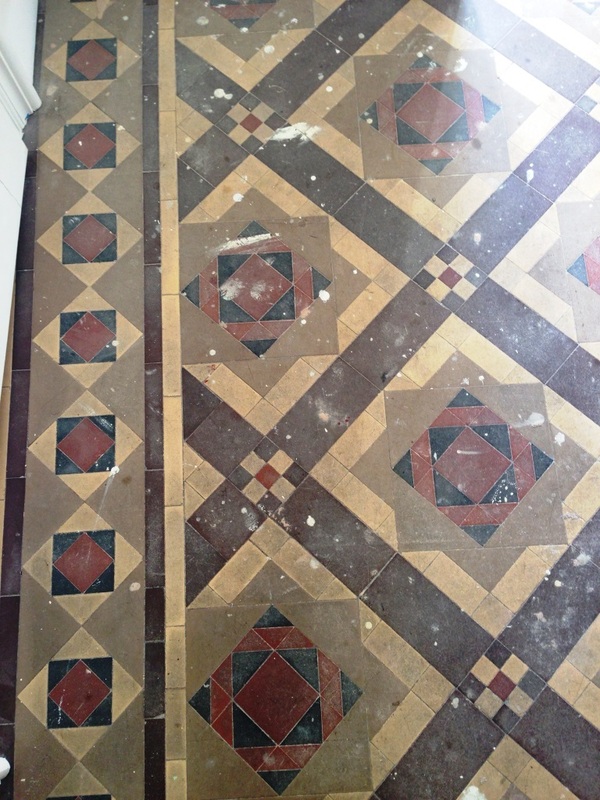 It had not been deep cleaned for a number of years and a number of layers of old sealer were visible causing a yellowing of the tile. 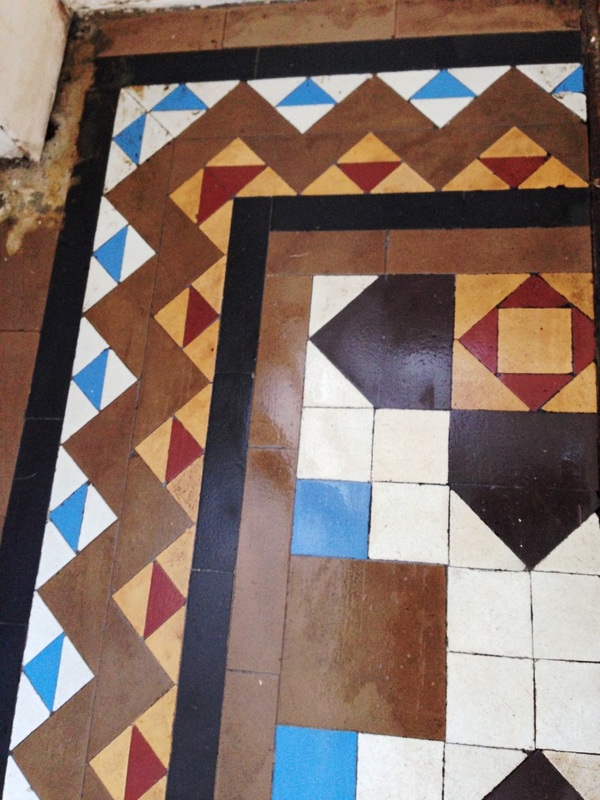 The old sealant needed to be stripped off before cleaning could take place and leave the Edwardian floor in a state ready to receive a new seal. To remove the old sealer a dilution of Tile Doctor Remove and Go which is a solvent based stripper was applied to the floor, left to dwell for a while and then steamed into the tile which helps to break up the old sealers. 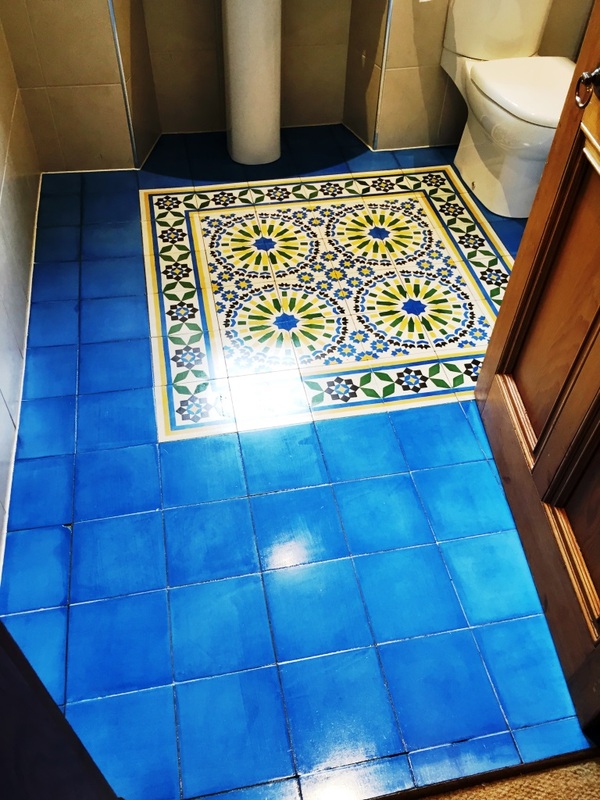 The tiles were then scrubbed using a rotary machine and a dilution of Tile Doctor Pro-Clean which is a strong alkaline product and the residue pressure rinsed away. The soiled residue was then removed using a wet vacuum and the floor rinsed thoroughly. Hopefully you can appreciate the difference from the photographs and how the appearance of the tiles now looks much fresher. 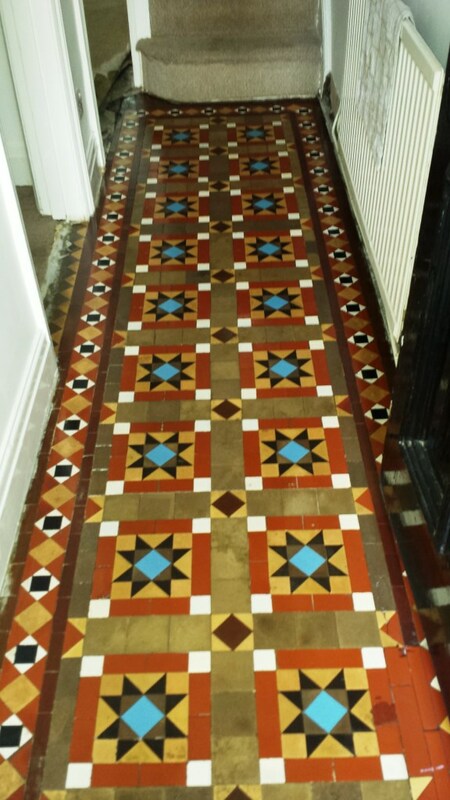 After removing the hallway carpet the new householders had discovered a Victorian tiled floor and being keen to restore it as an original feature made contact with Tile Doctor. 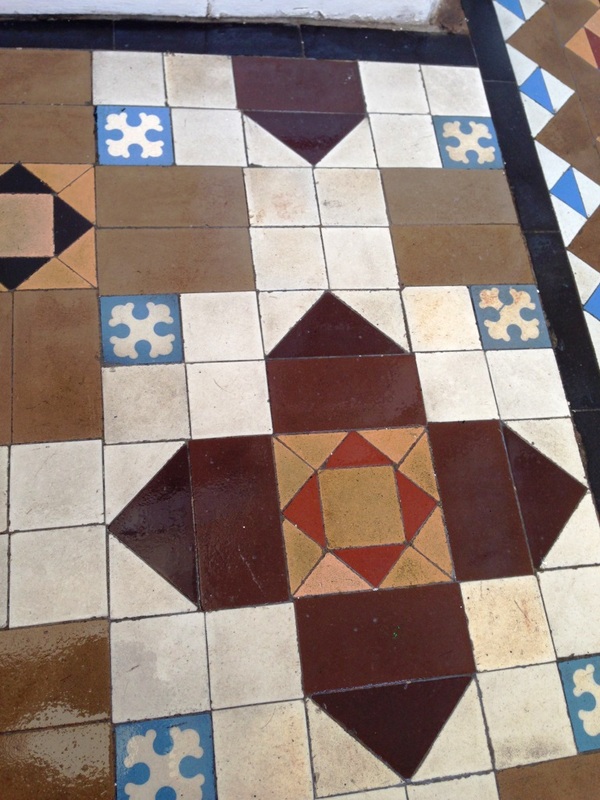 Restoring original features can add a lot a value to a house so it’s well worth pursuing. Before starting any cleaning I put the damp meter reader on several tiles to check the damp levels which read border line .15 -.17 in places which I was not very happy with especially as the weather we’ve had recently had been hot and dry in Cardiff for some time. Undeterred I scrapped the whole floor and then chiselled the edges with Hammer and bolster; next I mixed a 50:50 batch of Tile Doctor Remove and Go with NanoTech Ultra-Clean cleaner and applied this to the whole area, agitated it with a black pad fitted to a rotary machine and left it to dwell on the tile for half an hour so it could work on any old sealers that may have been present on the tile. I then rinsed the floor twice and although the floor was looking better I could really see how bad the condition was so next I applied undiluted Tile Doctor Pro-Clean to the whole floor which is a strong alkaline cleaner. It was left to dwell on the floor for half an hour scrubbing in between, rinsing with clean water as I carried on. 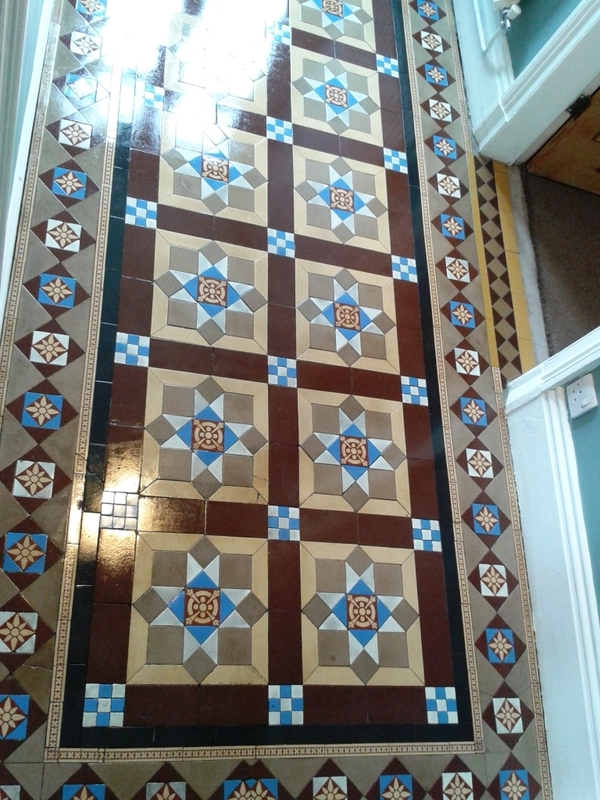 Although improved again I was still not happy with the results especially the borders as there appeared to be dark cement stains deeply ingrained into the tiles which no doubt had been there for eighty years. So next step was to apply Tile Doctor Grout Clean-up which is designed to remove mineral deposits and cement, it’s very effective solution for this type of work and it removed most of the stains but not all. The floor still needed more work so in my frustration I rinsed the floor and mixed a concoction of Remove and Go, Pro-Clean and Grout Clean-up together with a squirt of the NanoTech Ultra-Clean cleaner and spread it over the whole area leaving it to dwell for around 10 minutes before scrubbing it again. The floor was then rinsed and then for the final clean I steam cleaned the area twice rinsing in-between. The cleaning was done on a Friday and then left to dry out over the weekend. I returned on Monday and tested for moisture which was slightly high in places so being ever over precautions dried the whole floor with a heat gun until it gave me an absolute dry meter reading. I left the floor to cool down to ambient temperature and then sealed it with three coats of Tile Doctor Seal and Go. 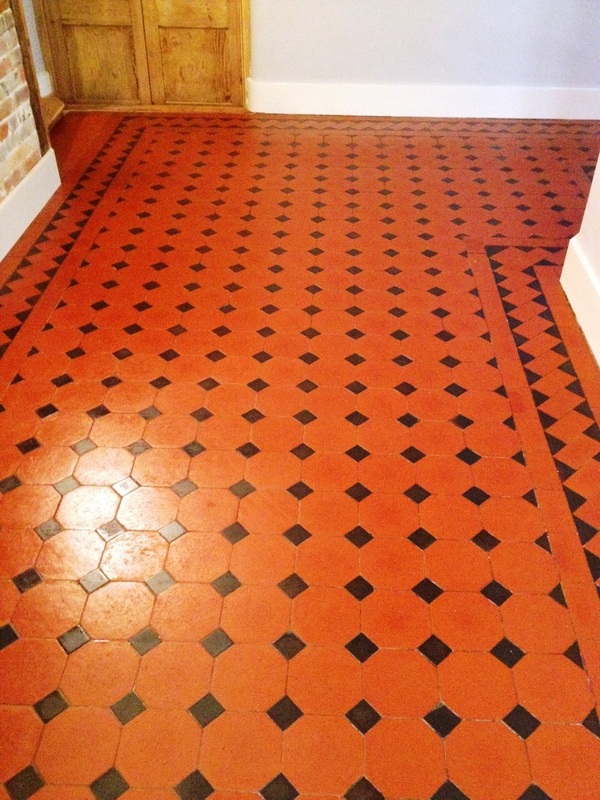 The customer was over the moon and I think you will agree that the tiles have been renovated to a high standard. 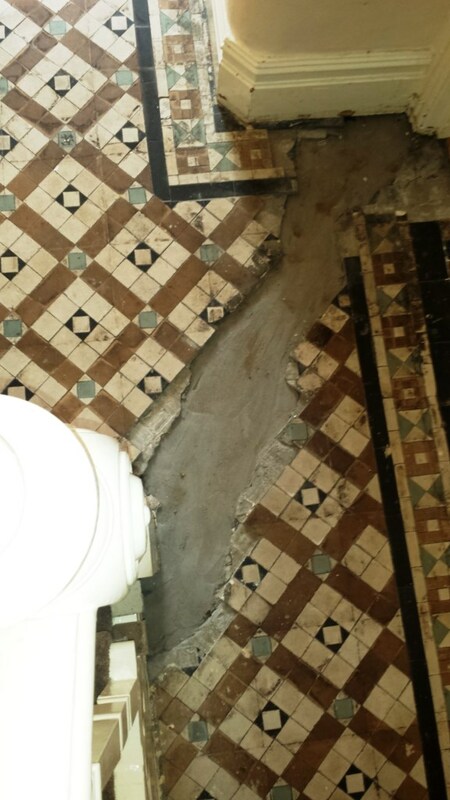 This original Victorian Tiled floor was uncovered at the Grade 2 listed Salford Town Hall in Salford, Manchester. 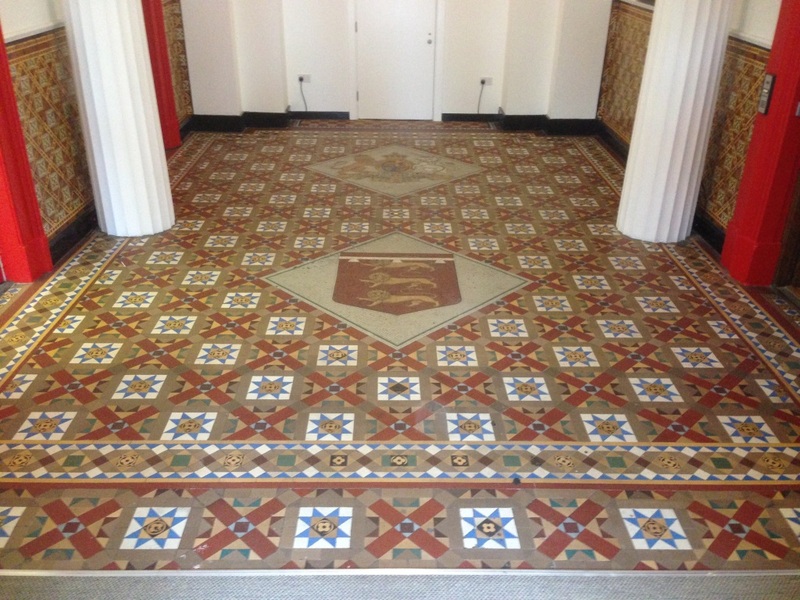 This public building which built around 1827 was the former Salford Town Hall and Magistrates Court; it’s currently being turned in to luxury apartments and this amazing floor is located in the main entrance hall. The floor was only recently re-discovered during the conversion works after being hidden for many years and was in surprisingly good condition. The company remodelling the building are maintaining the historic features so we got the call to go in and clean and seal the floor. Cleaning the floor was fairly straight forward and involved the application of a dilution of Tile Doctor Pro-Clean which was left to dwell on the tile for around ten minutes before being worked into the Tile and Grout using a rotary machine fitted with a black pad. The dirty solution was removed using a wet vacuum and the whole floor rinsed down three times to ensure there was no trace of cleaner left on the floor. 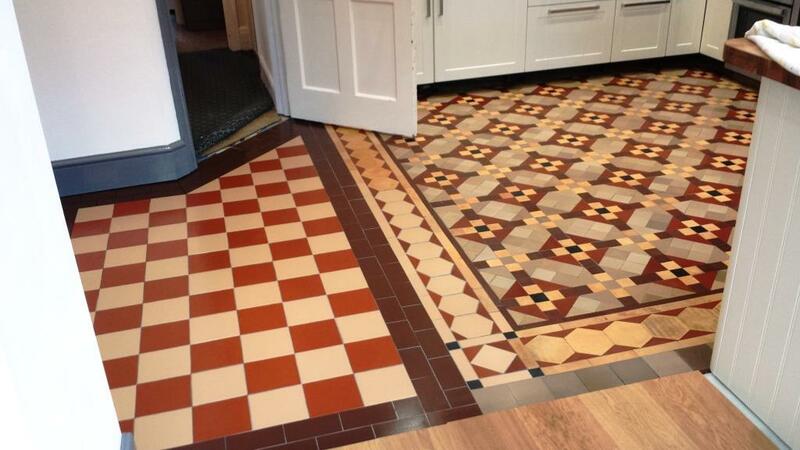 It’s a large tiled area so it took the whole day to complete. I returned the next day to see that the floor had dried off overnight and so started to seal it using Tile Doctor Seal & Go which is a topical sealer that adds a nice shine to the tiles, five coats of sealer were needed before the tiles were fully sealed. 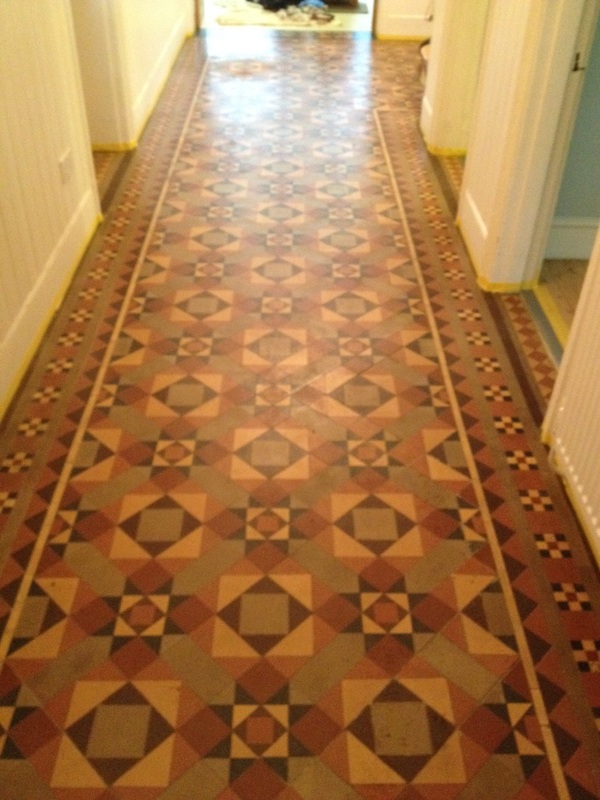 I think you would agree the floor now looks fantastic; certainly the client was happy with the finish. 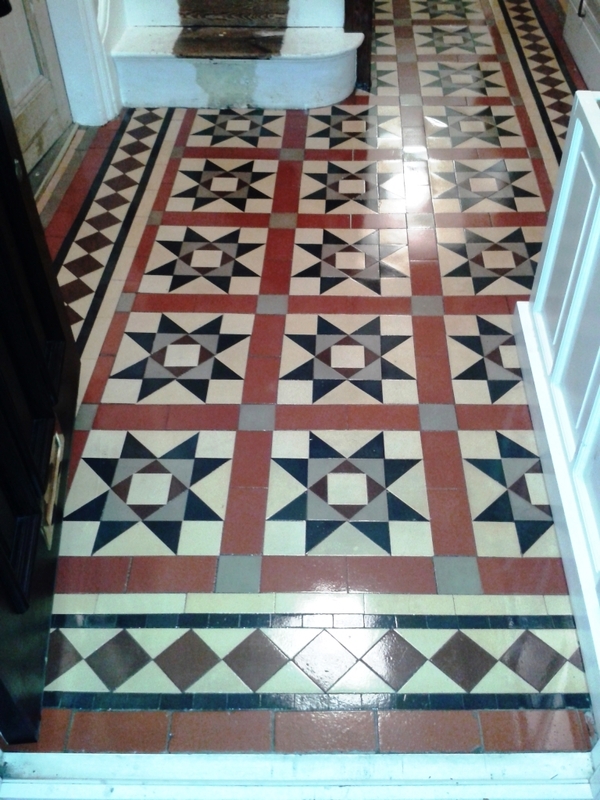 This Black and White Victorian Tiled hallway floor laid in a “Starburst” pattern at a house in Penarth which had been previous restored in 2011 by another Tile Doctor however the house had recently been subject to some renovations and unfortunately the builders did not cover the hallway floor (typical) so the floor was looking rather tired when I came round to take a look. 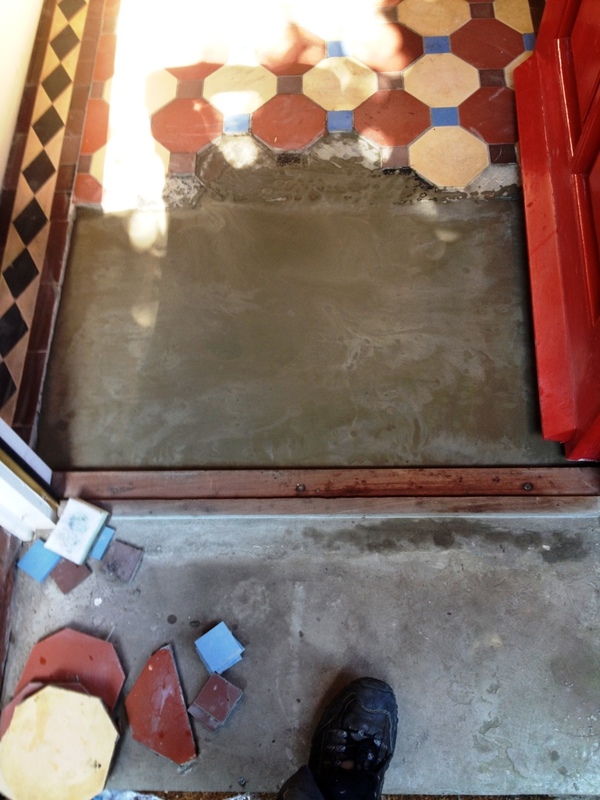 Whilst I was there I took a damp meter reading which showed the floor to be bone dry which given the hot weather was to be expected; a dry floor and hot weather works in our favour as restoring a tiled or stone floor in hot weather is much more efficient as everything dry’s so quickly. 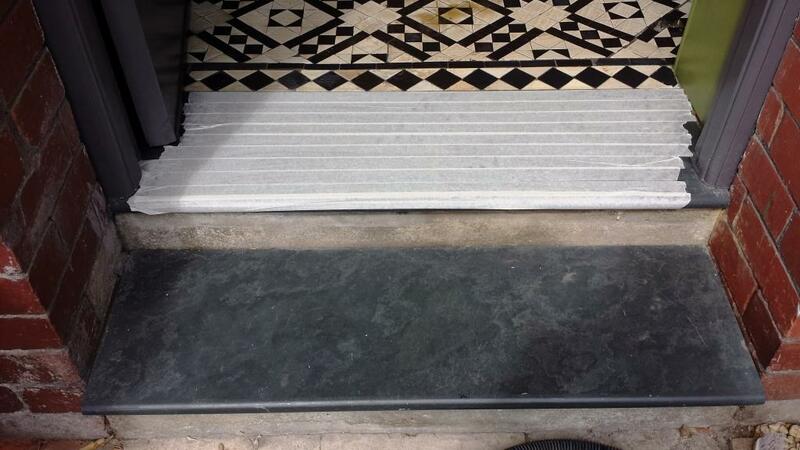 My first job was to apply masking tape to the Slate step at the front doorway as the customer was very proud of it and I certainly didn’t want to get any Tile Doctor Remove and Go on it which would of stripped of the sealer. I then cut out a few tiles which were to be replaced before cleaning the whole floor with a dilution of Tile Doctor Remove and Go mixed 50/50 with NanoTech UltraClean to make it more effective. The solution was left to dwell for around ten minutes before being scrubbed into the tiles using a rotary machine fitted with a black coarse pad. This process not only removed any previous sealer but really thoroughly cleaned the tiles as the small abrasive particles in the NanoTech UltraClean gave the floor a light abrasive deep clean. I should mention that during the cleaning stages I rinse the floor at least four times with clean water and then steam clean the whole floor to open up the pores to ensure that there is no cleaning agents present. I then give the floor a final rinse using a wet vacuuming to remove the water and make the floor as dry as possible prior to sealing. Before leaving for the day I carefully fitted the replacement tiles. I cleaned the floor on Friday so it was left to dry out over the weekend coming back on Monday to ensure it was dry and then sealing it with multiple coats of Tile Doctor Seal and Go which works very well on Victorian floor tiles as it gives a nice satin sheen as well as providing stain protection.